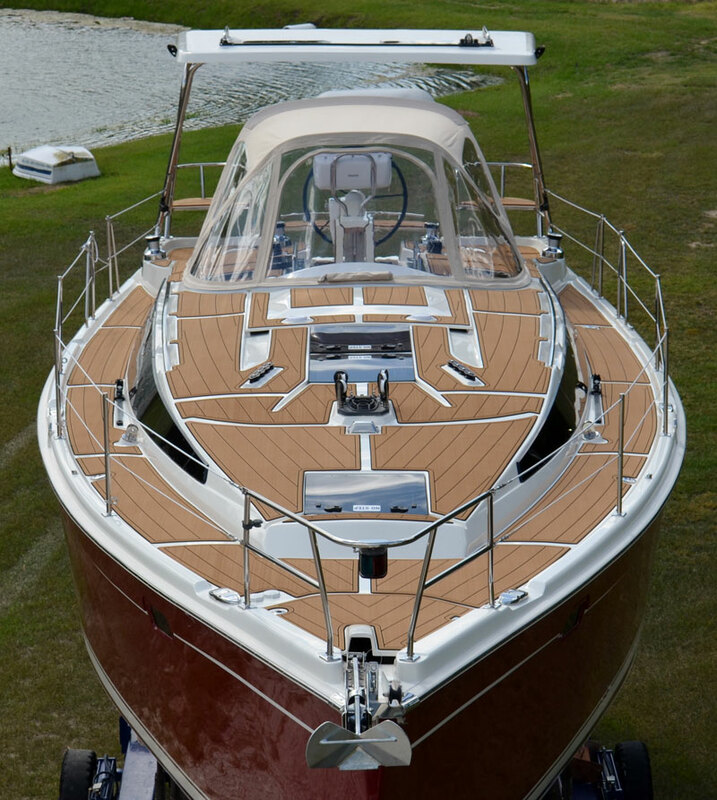 First I want to thank you for producing a truly great boat! 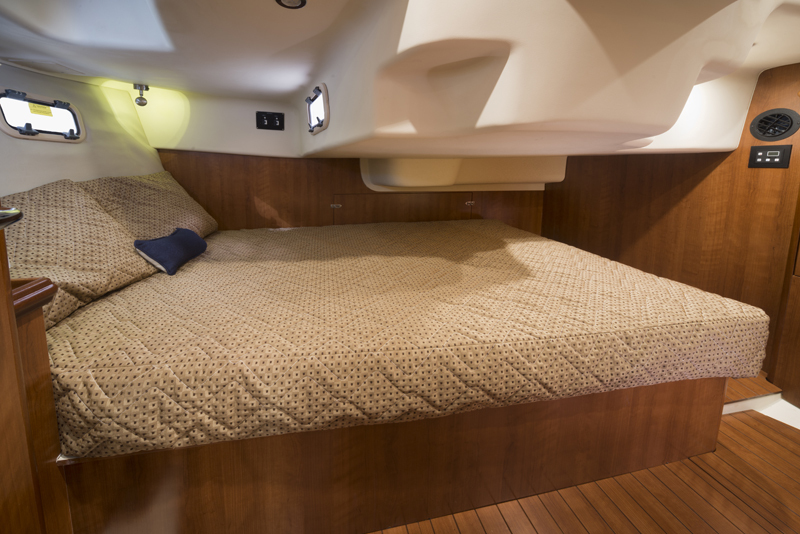 We own 426DS S/V Sweet Escape and just love her. 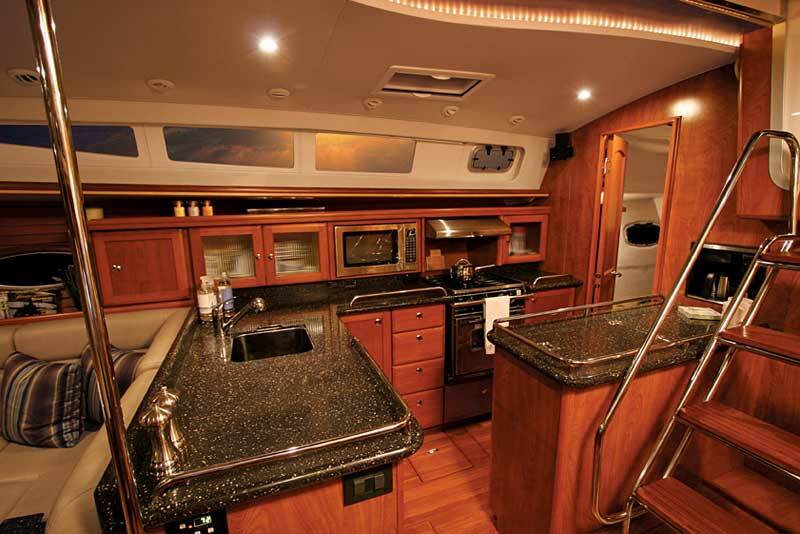 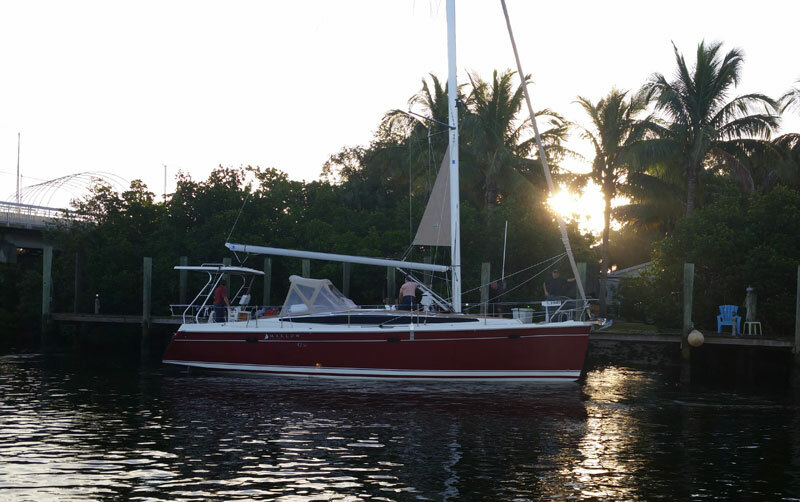 We purchased the boat in April 2012, moved aboard in July and left Racine Wisconsin on August 1, 2012 – taking Sweet Escape all the way to Key West Florida and the Bahamas. 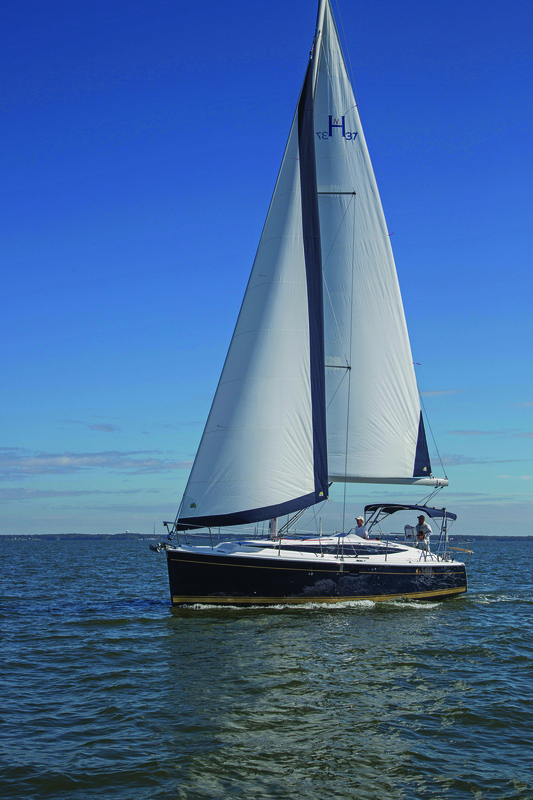 This is an outstanding vessel for cruising and living aboard and contrary to popular belief in the sailing community – blue water sailing. 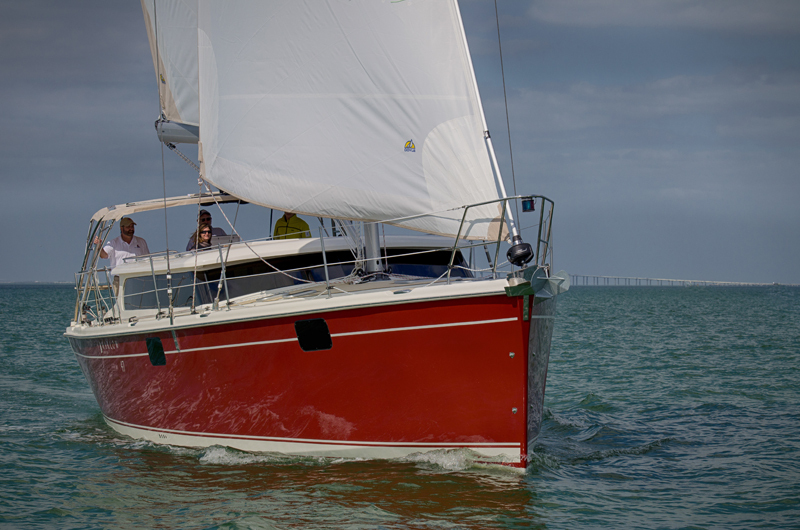 So far we have put more than 4000 miles under her keel with no major problems. 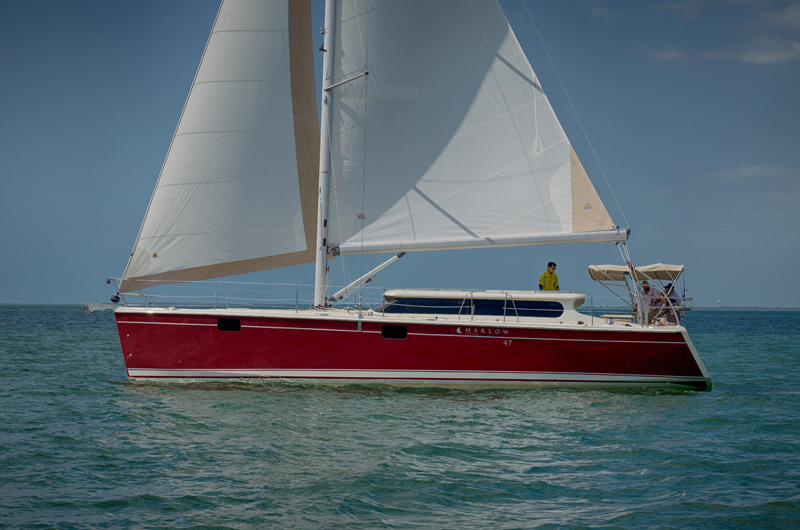 This fall we will head back out to the Bahamas and plan to take Sweet Escape all the way to the southern Caribbean on a cruise that we expect will last several years. 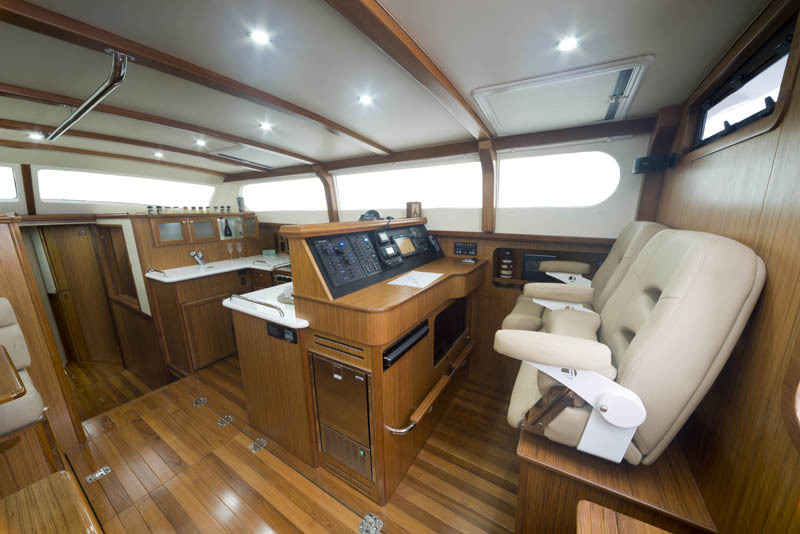 I have never met a Hunter owner that was unhappy with their boat but I have met a lot of owners of other brands that are quite ignorant about the capabilities, living comfort and quality of these great vessels and allowing a bunch of happy owners to be heard might be a good way to dispel some of that. 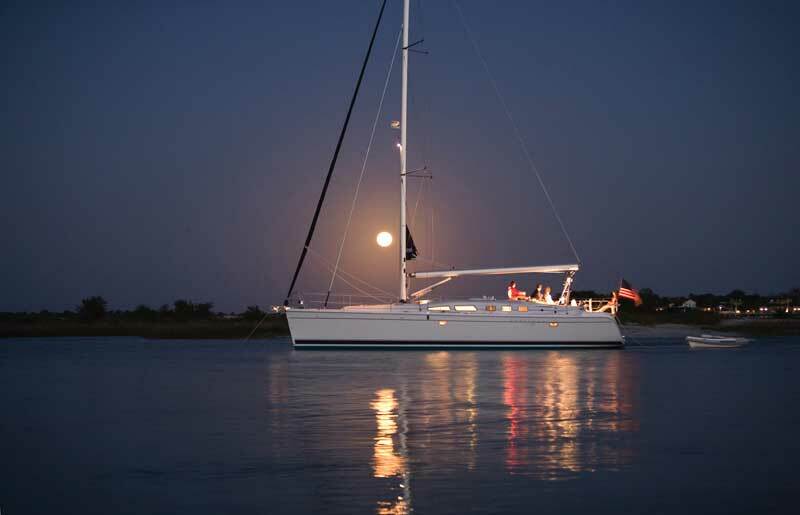 Thanks for your time and once again thanks for a great sailboat! 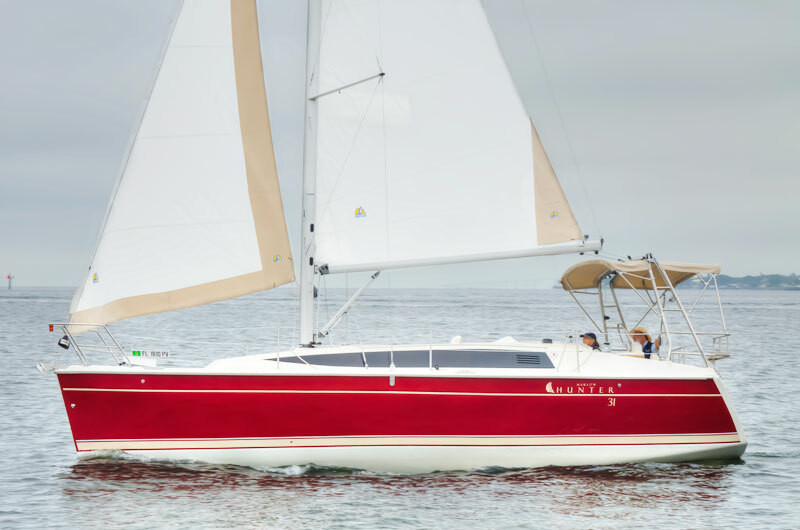 My wife and I have been sailing for over 30years and owned 6 boats from 16ft to our H41.Each boat we had purchased new from Nordica to Oday to Catalina. 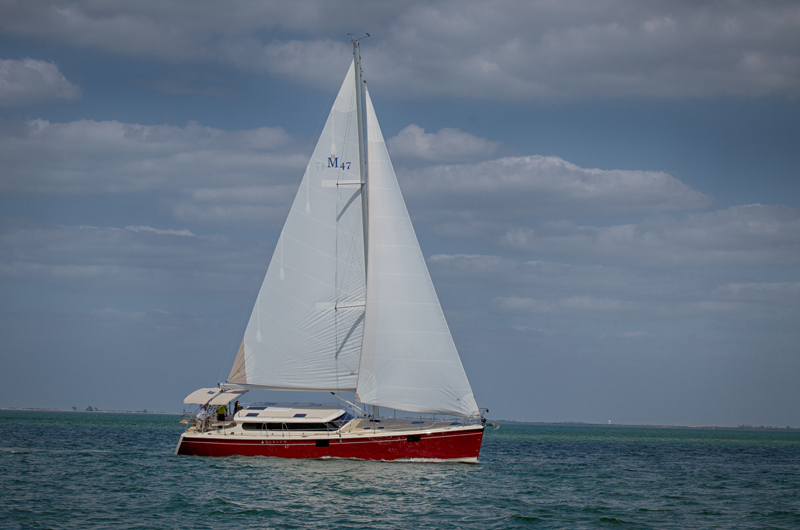 Our boat just before the Hunter was a Catalina 36 which we owned and sailed for 14 seasons(Great boat). 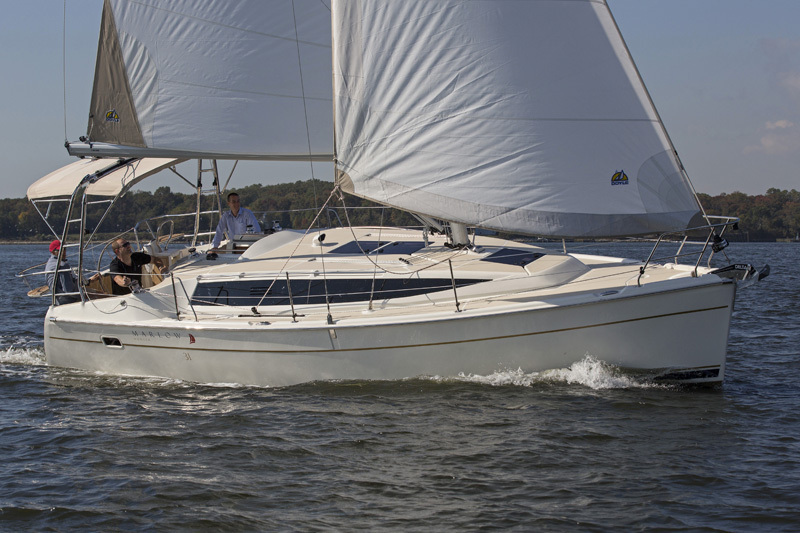 I have charter 42-45 ft sailboats( many different makes) all over the US to take out clients so I have experience with different manufacturers. 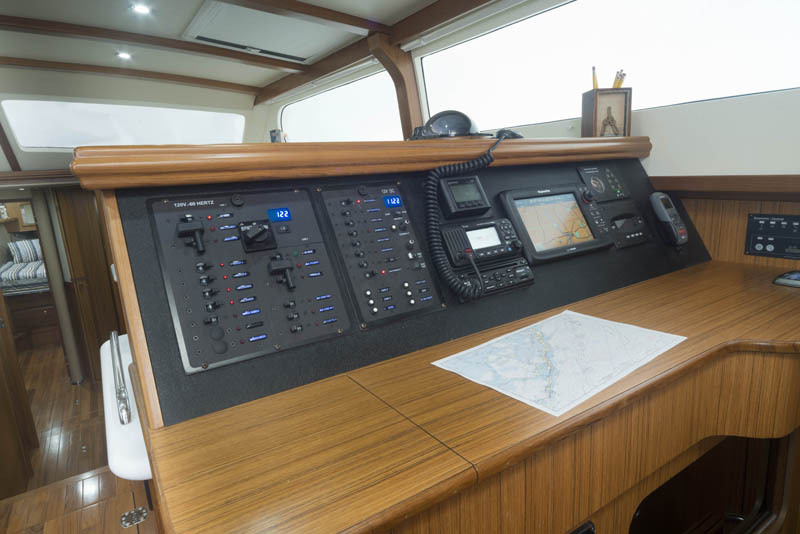 Also I am very particular on how the boats are built and operate. 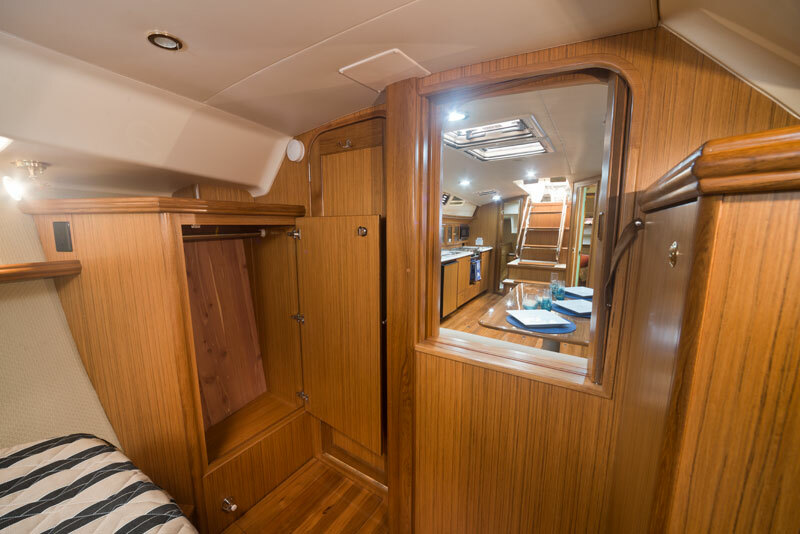 In 2010 we purchased a left over 2007 H41AC thinking our sailing days were over and would resign ourselves to having a trawler with a big mast. 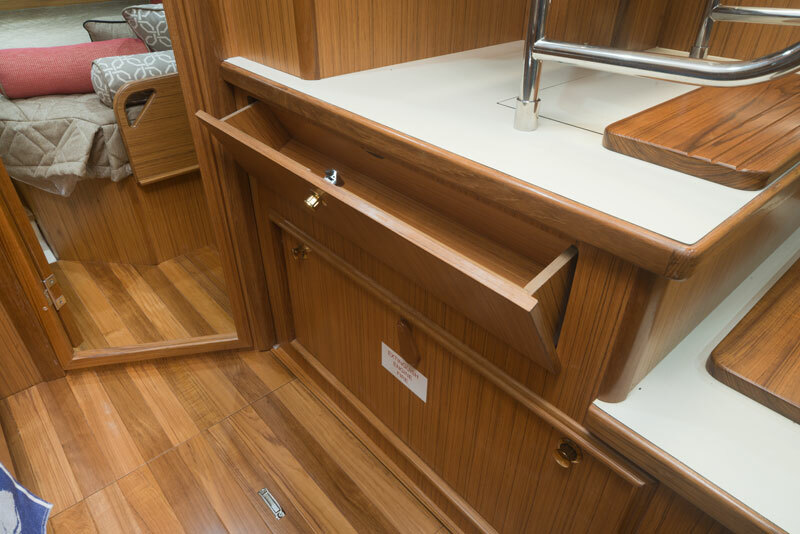 When we started looking the boat over I inspected every aspect of how it was built-hull, keel, mast, engine,equipment, hardware Etc. 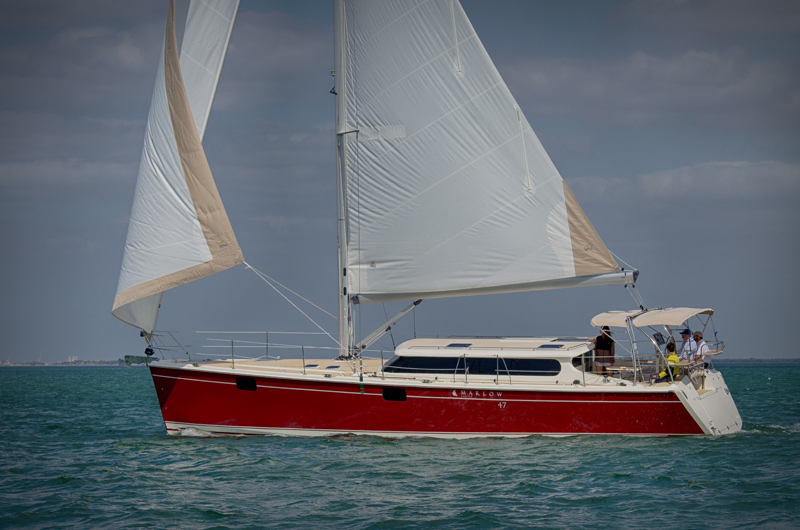 Once I saw how well the Hunter was made we agreed to buy it but once we sailed it we were surprised how well it sailed. 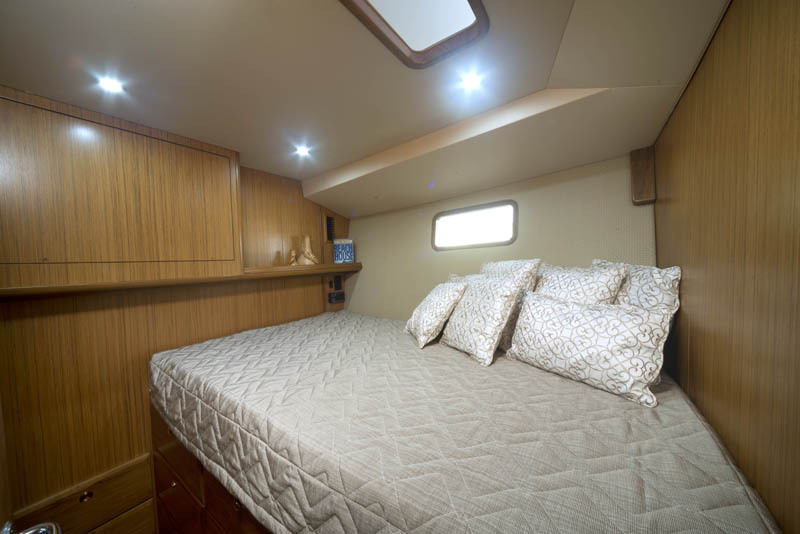 Well really my dreamboat would be one of the top elite semi custom boats, but we feel the Hunter we have is the best of any other boat we sailed and is best in class. 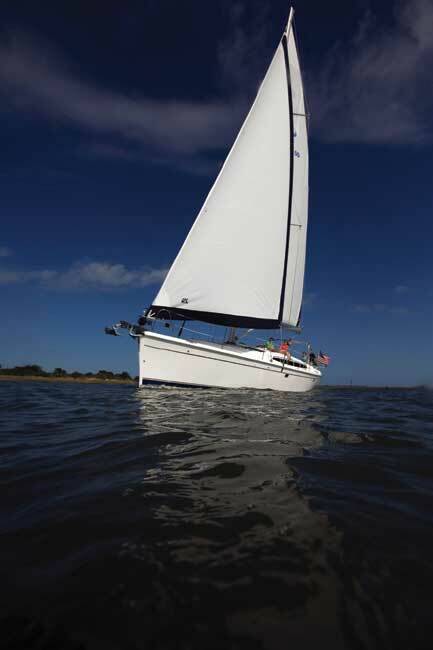 The boat is a great boat for anyone but especially someone over 50 because of the fractional rig/small jib big main. 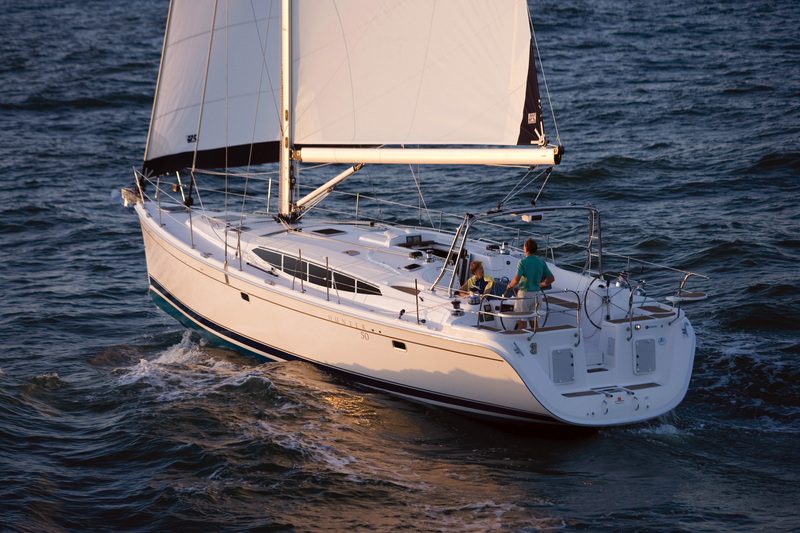 There are many days we just sail with the main to be lazy and we can still point 30-35 degrees in 5 -15 kts. 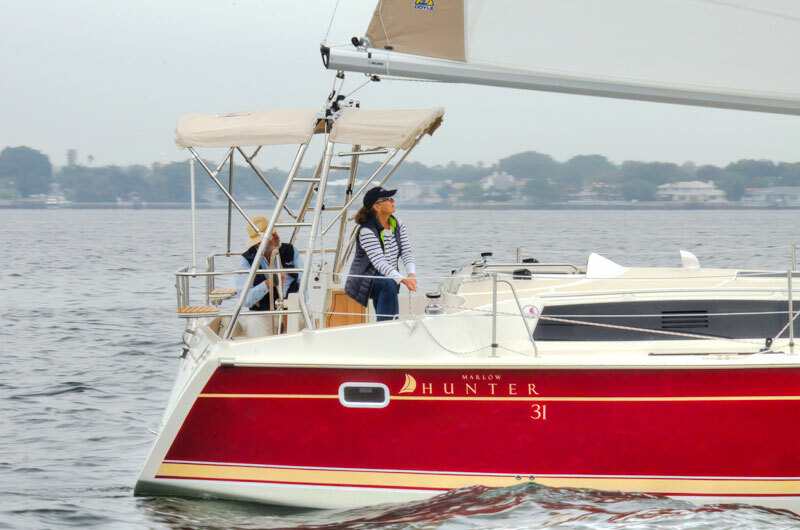 I have to admit years ago I would have never purchased a Hunter but now I regularly tell people how great a product/boat it is and how well made it is and nice it sails. 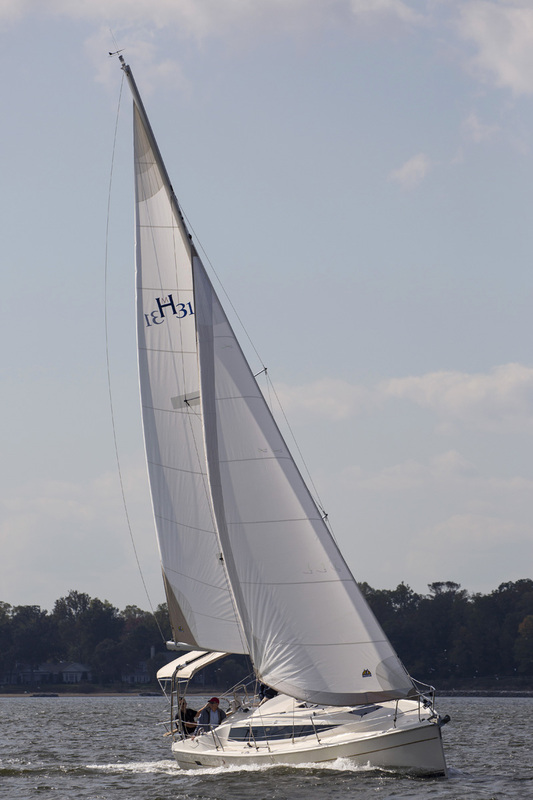 I raced on a Saber 405 for 10 years and a J30 for 5 so I am fussy about how a boat sails and know sail trim well. 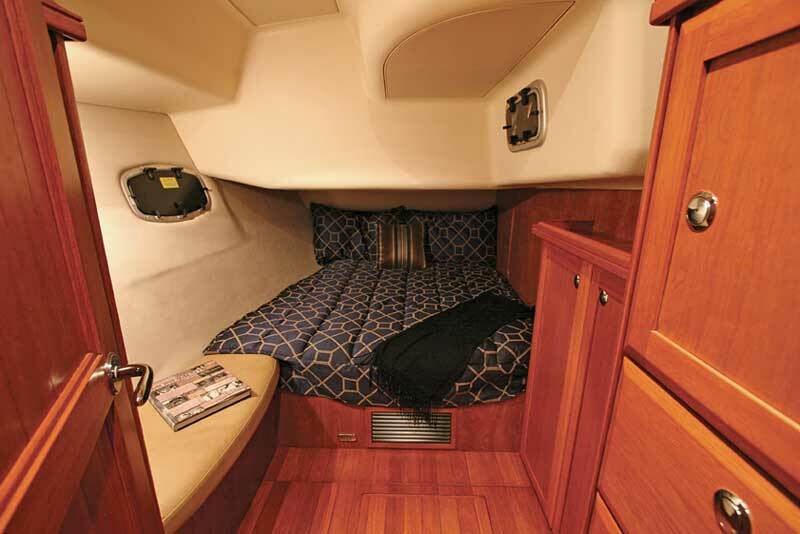 So far I have influenced at least two families to purchase a Hunter and one exactly like ours. 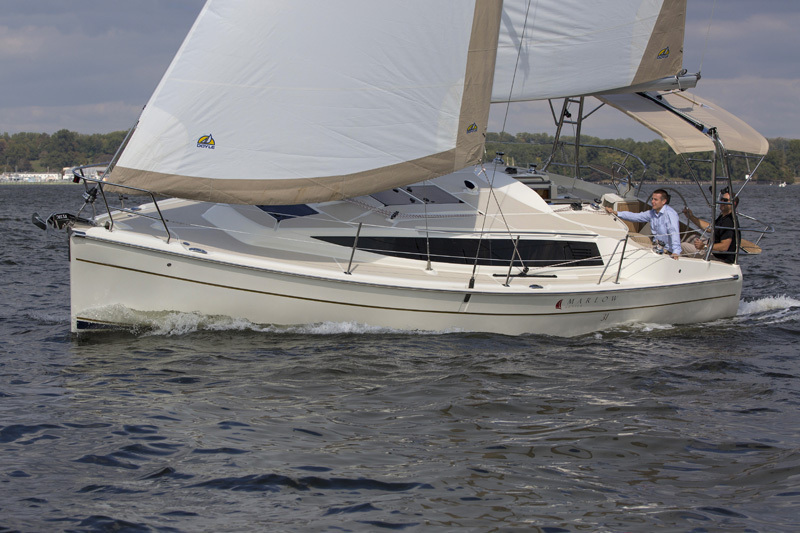 Even at a recent boat I was able to influence someone who was going to buy a Catalina or Beneteau 42 to switch to a Hunter. 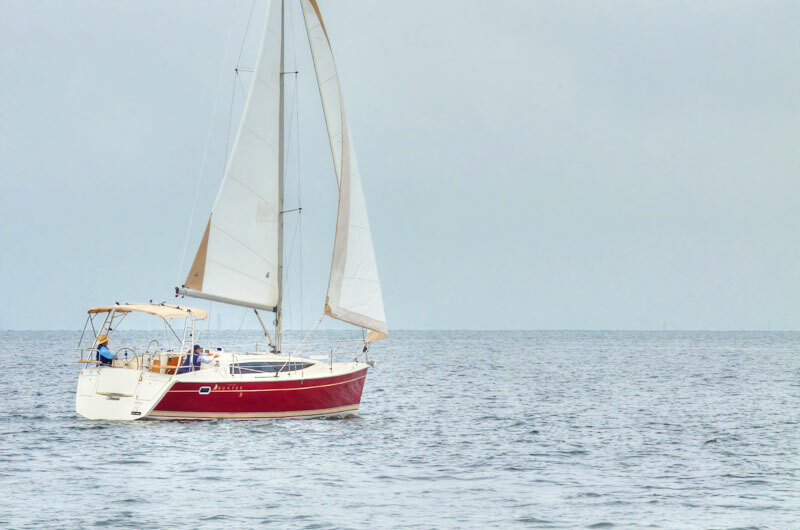 We have sailed our boat in some very rough seas with the boat pounding through the waves and all I keep hoping was it would stay together and it did. 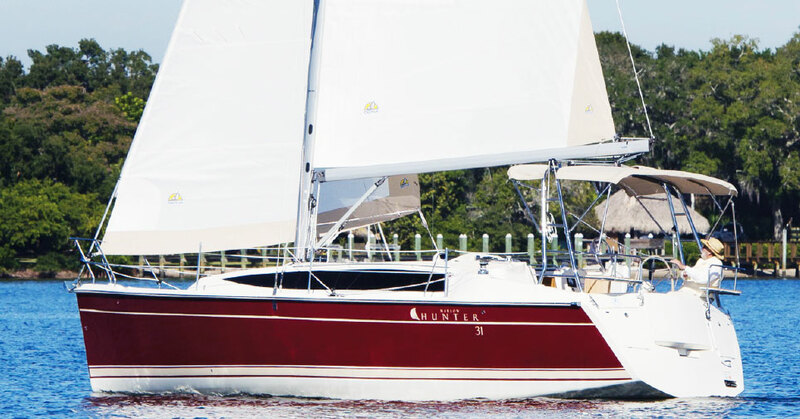 We love the product and would be pleased to speak with anyone concerning a Marlow Hunter sailboat. 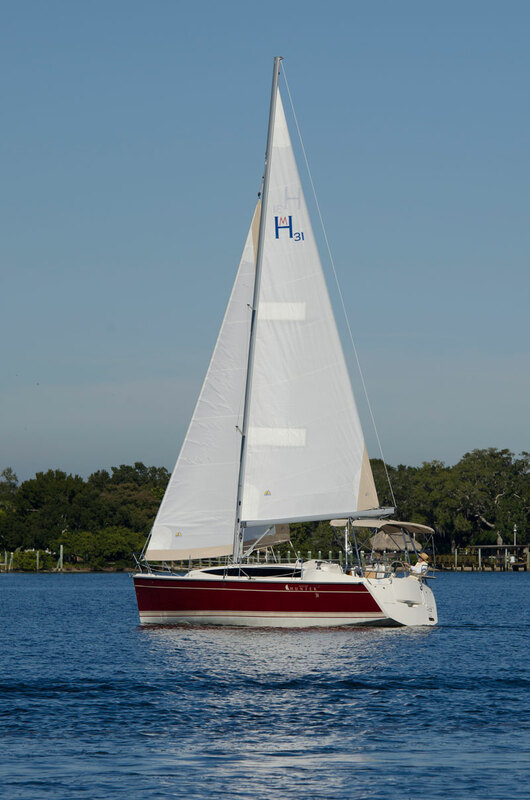 My wife and I took delivery of our new 2015 Marlow-Hunter in Early December 2014. 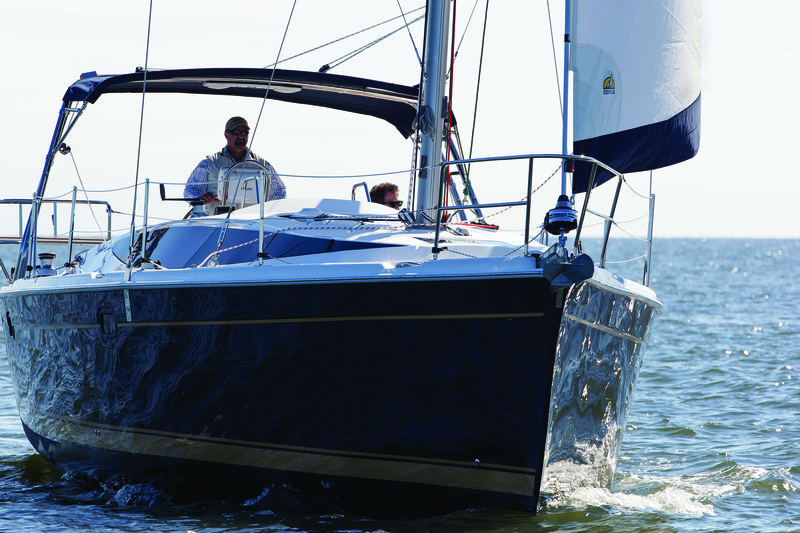 Prior to purchasing we looked at a number of new boat builders but really liked the Marlow-Hunter. 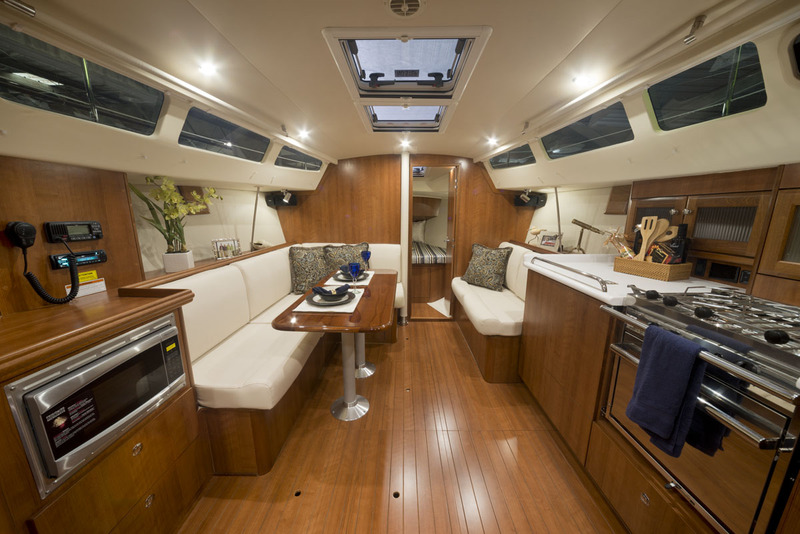 The sales team was knowledgeable and it was easy to discuss options on the build. 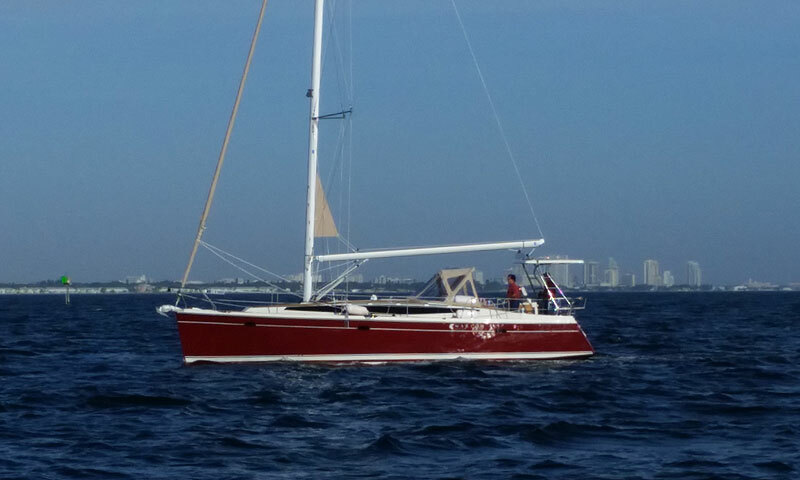 Plus we worked with Sailing Florida in St. Petersburg as our broker, Captain Dave Amman. 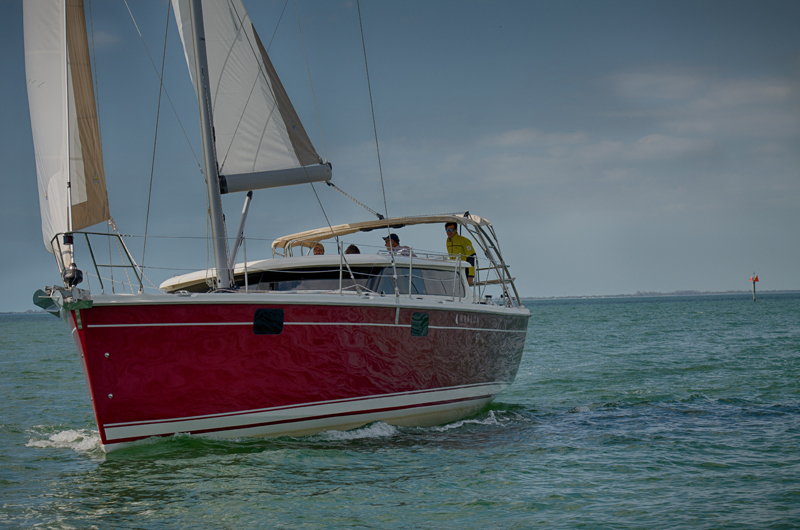 My wife and I visited the Florida, Alachua facility 3 times and were impressed with the new production of the 40. 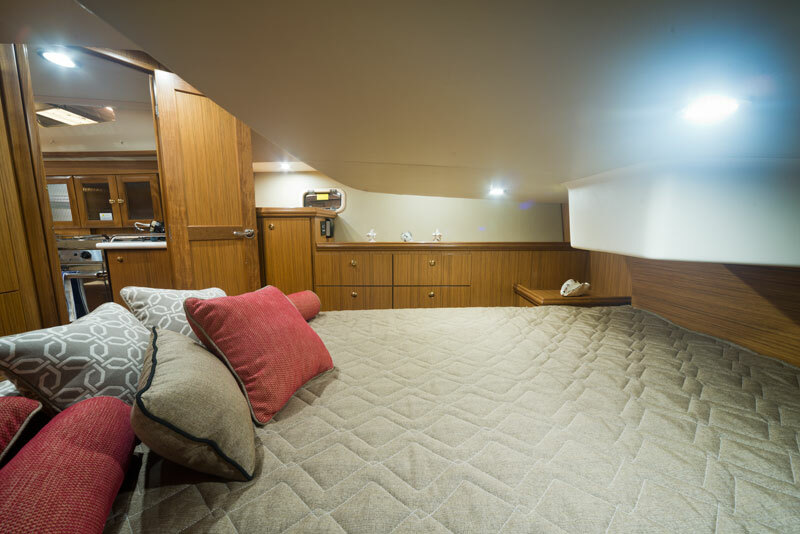 The new David Marlow/Glenn Henderson designed hull was very spacious and we liked the fact that the boat has no balsa wood and is hand-laid, rolled fiberglass hull with kevlar reinforced from bow to stern. 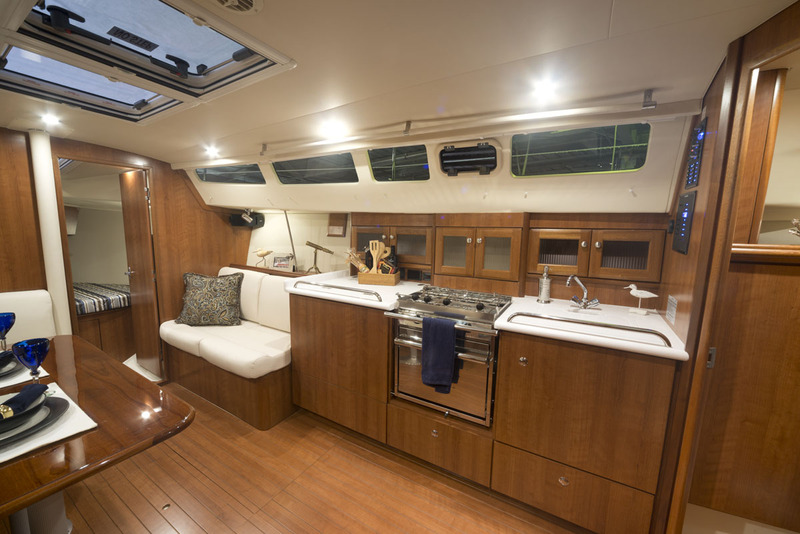 The attention to detail that Marlow-Hunter has put into the design and build on this 40 swayed our decision to buy! 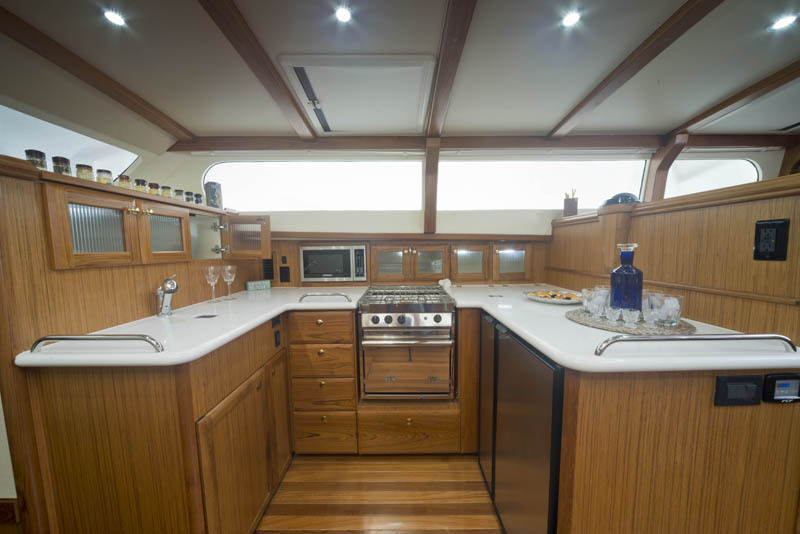 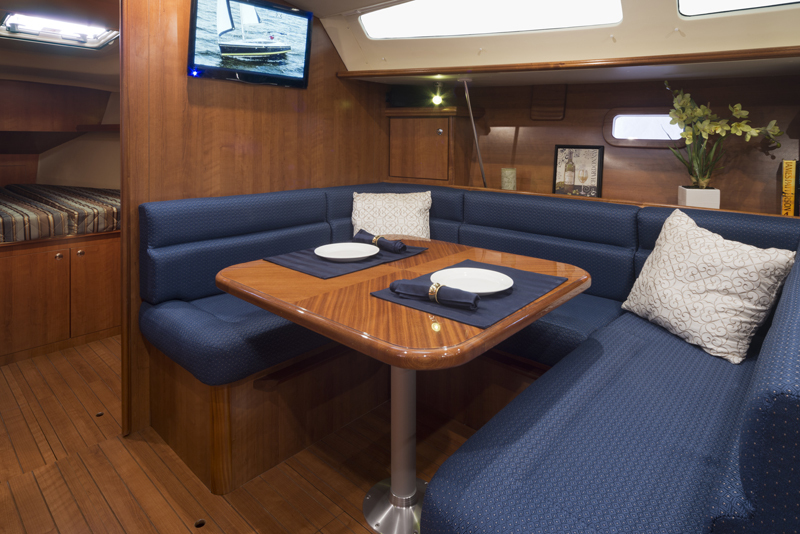 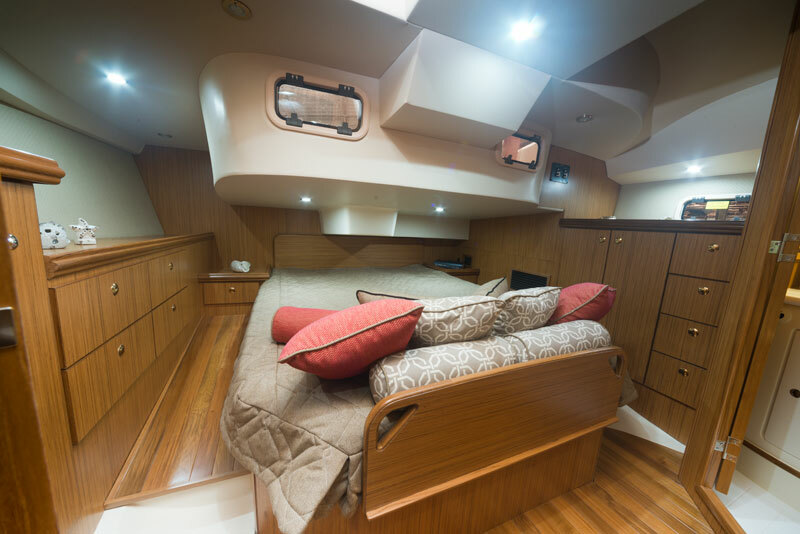 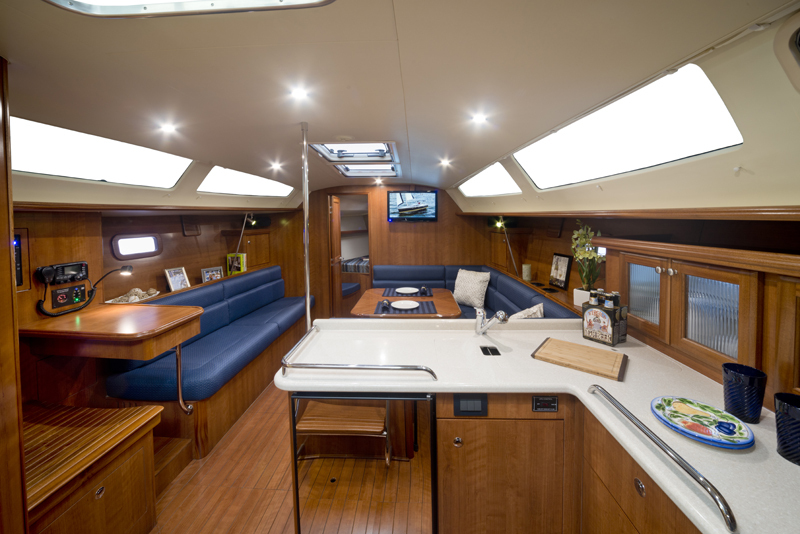 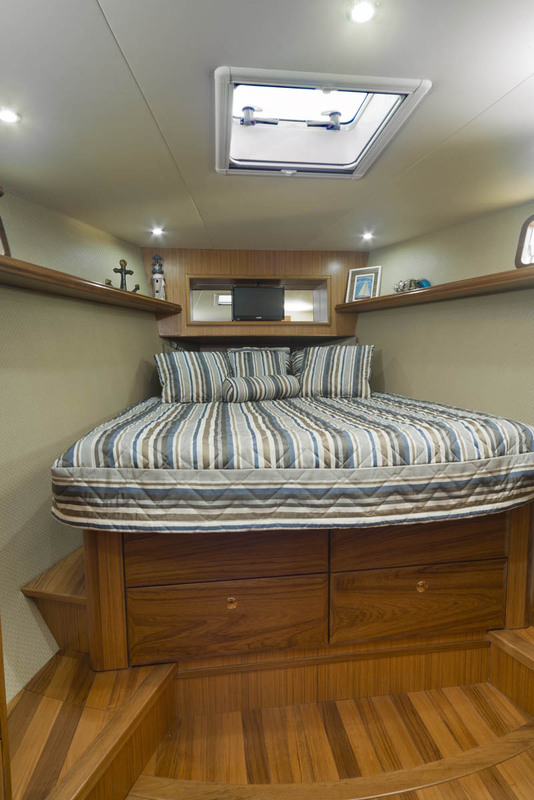 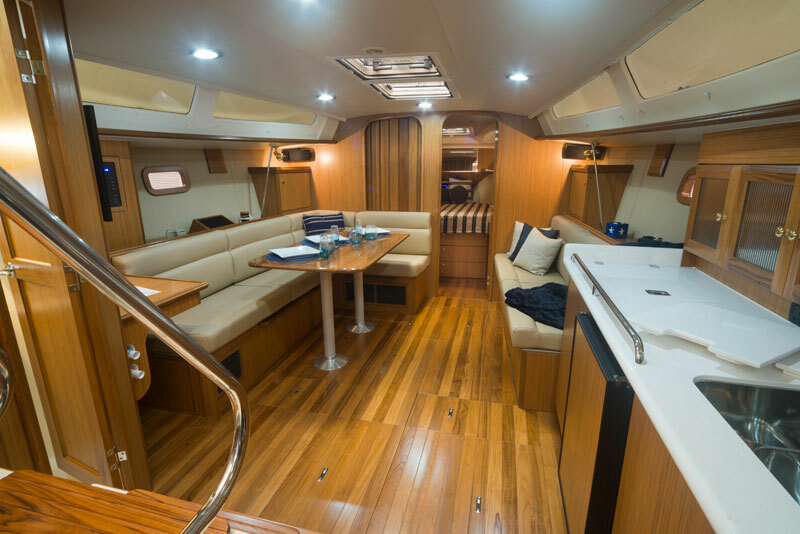 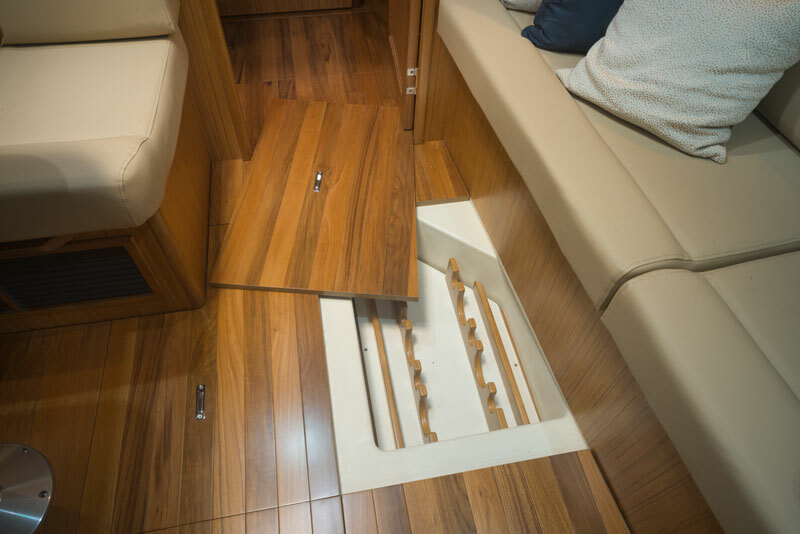 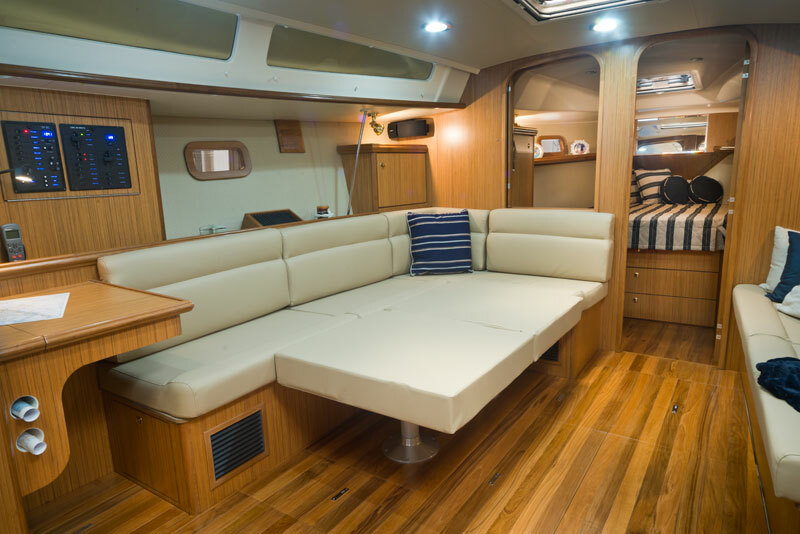 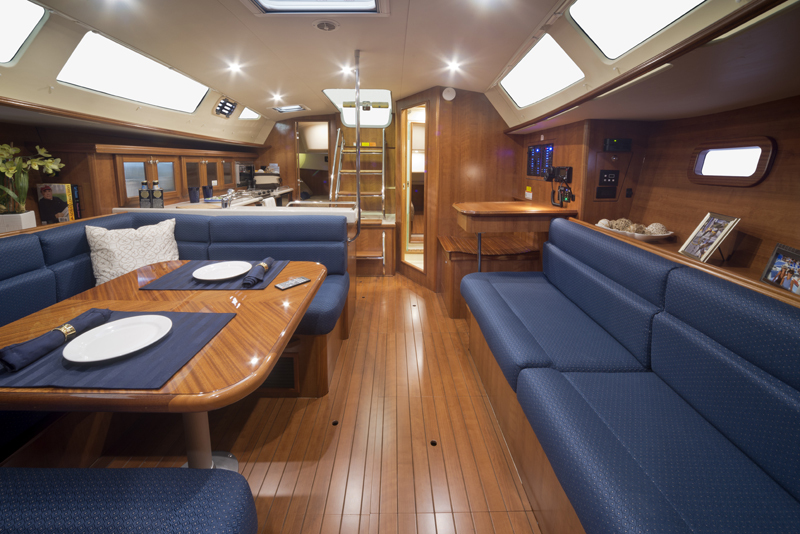 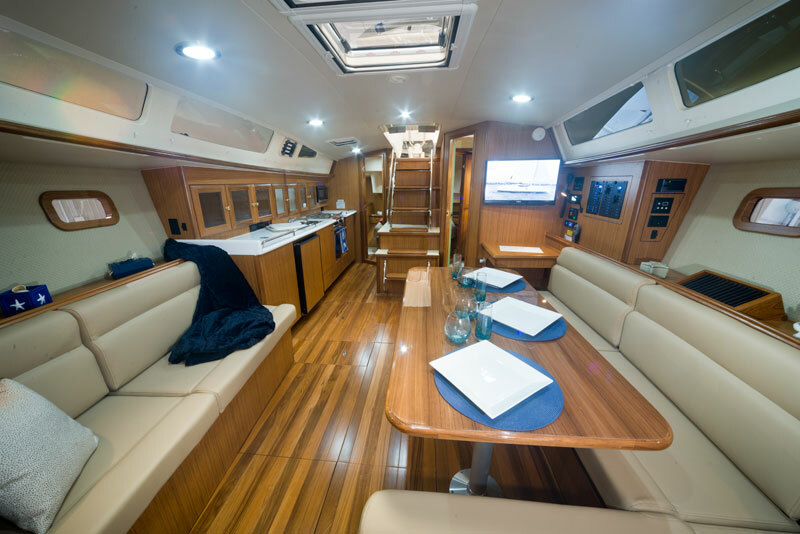 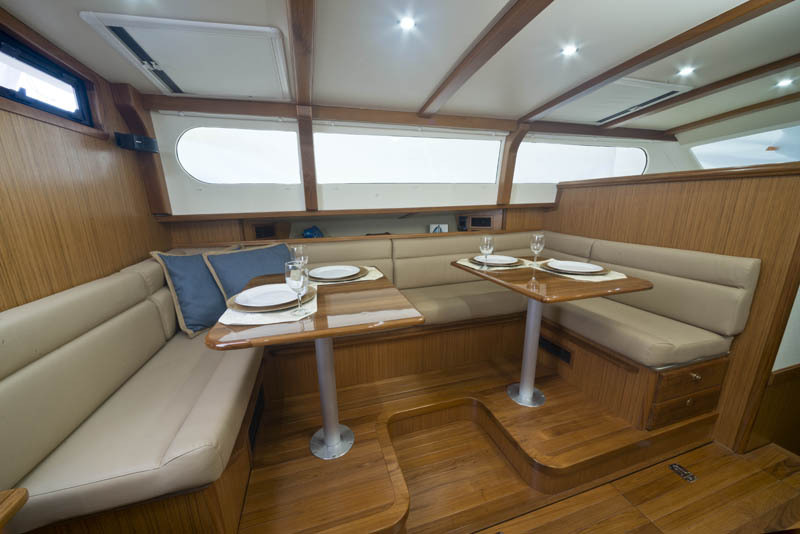 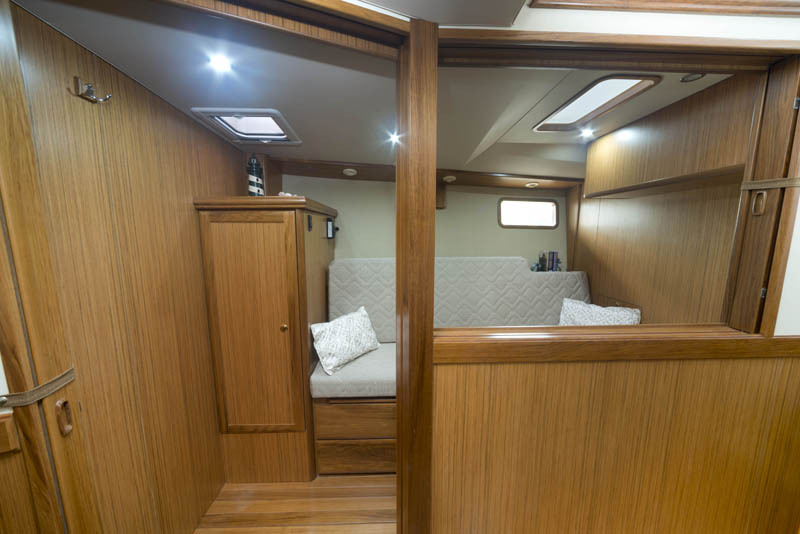 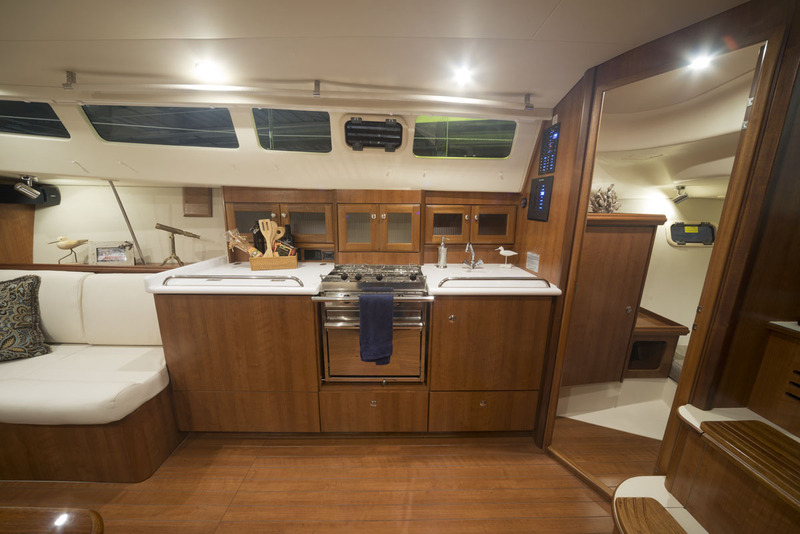 Everything is quality from the folding cleats topside to the impressive wood cabinets and real hardwood floors, plus double helm with Lewmar manba steering, the new sail-drive to the large folding stern/dive platform is very all very functional. 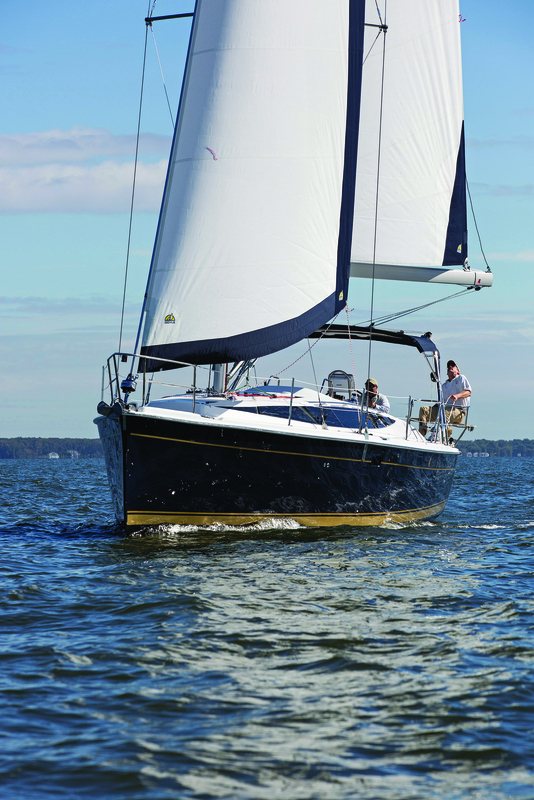 We selected many options including the Selden self furling main and jib/Genoa. 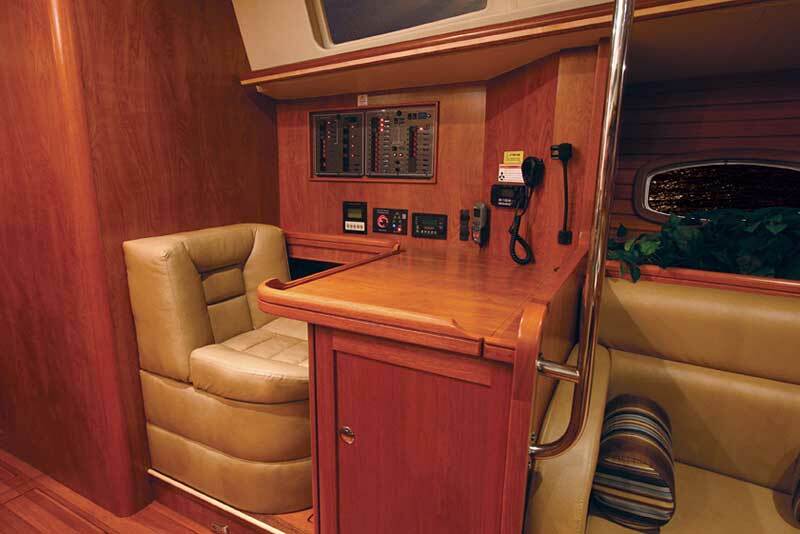 The cockpit is very spacious and can easily sit 8 people. 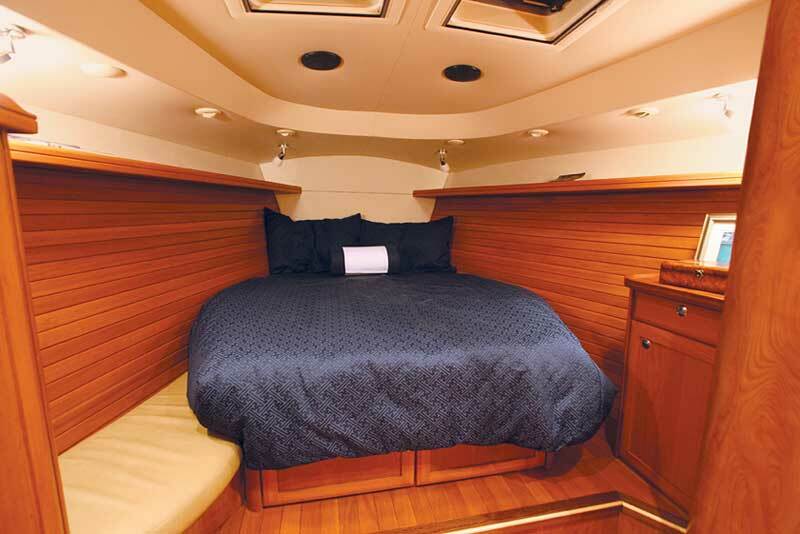 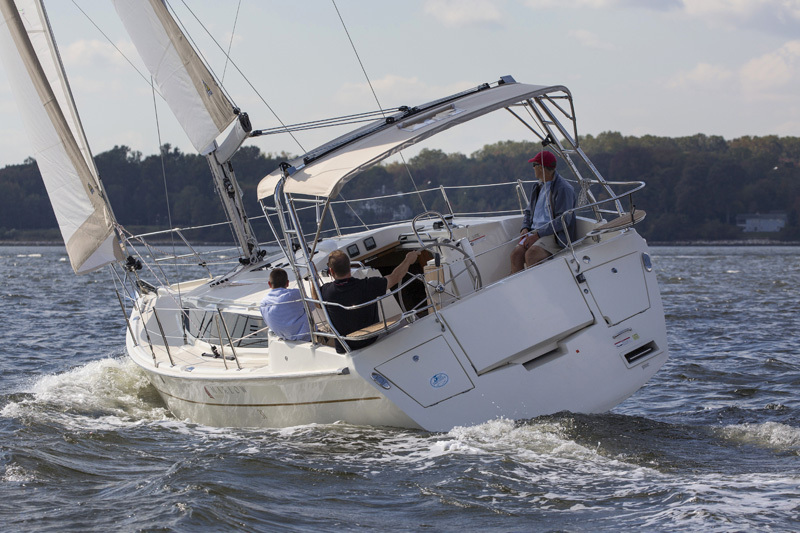 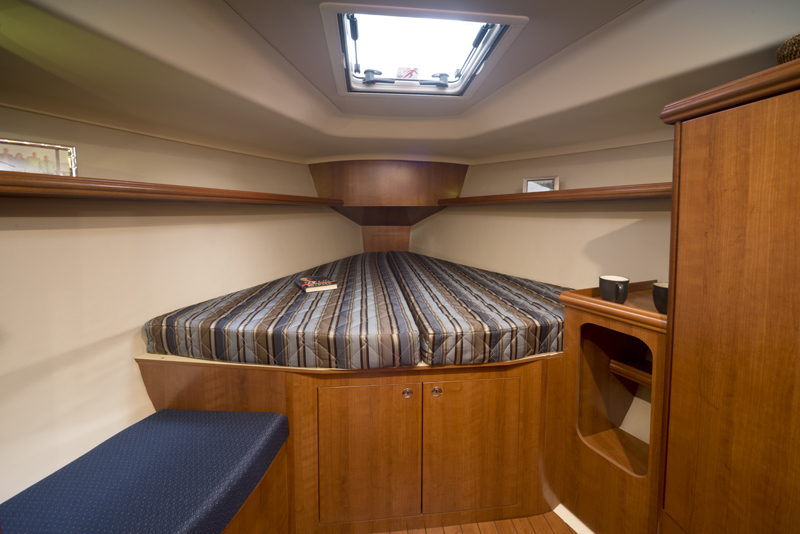 We also selected the extended Dodger and Bimini which is great for Florida sailing and offers lots of shade! 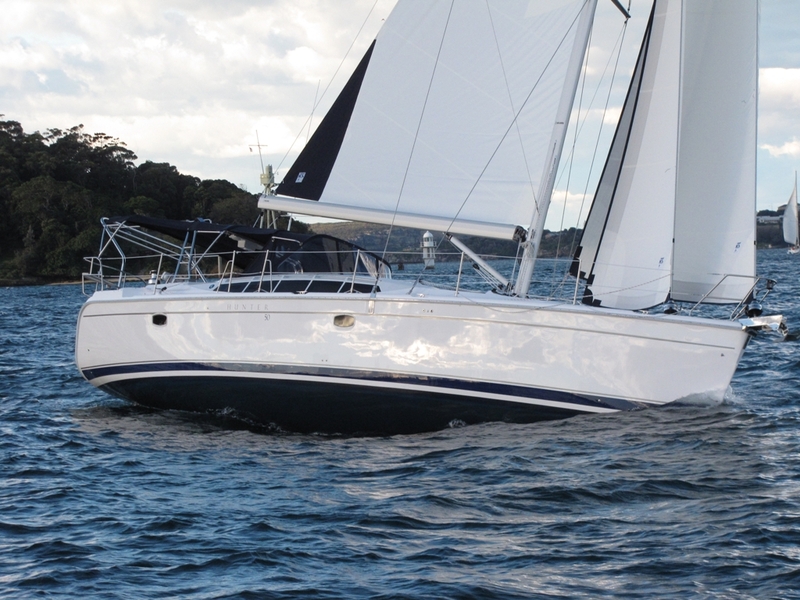 We also ordered the upgraded 54 Yanmar and at 2,000 RPM pushes the boat along at 7 knots SOG! 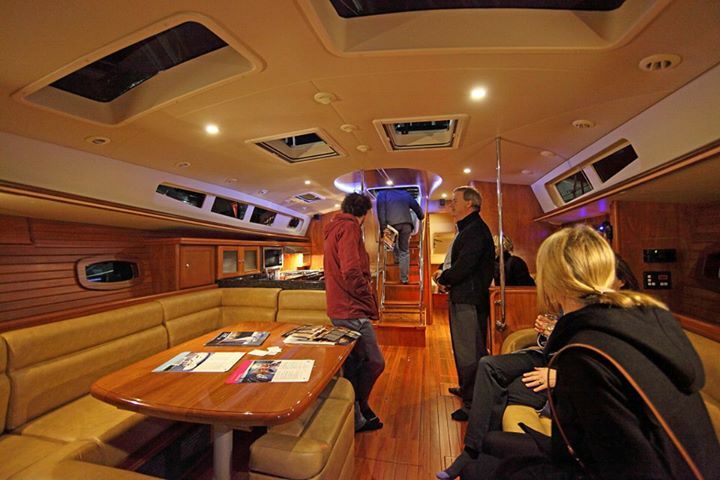 Impressive for a 20,000 lb. 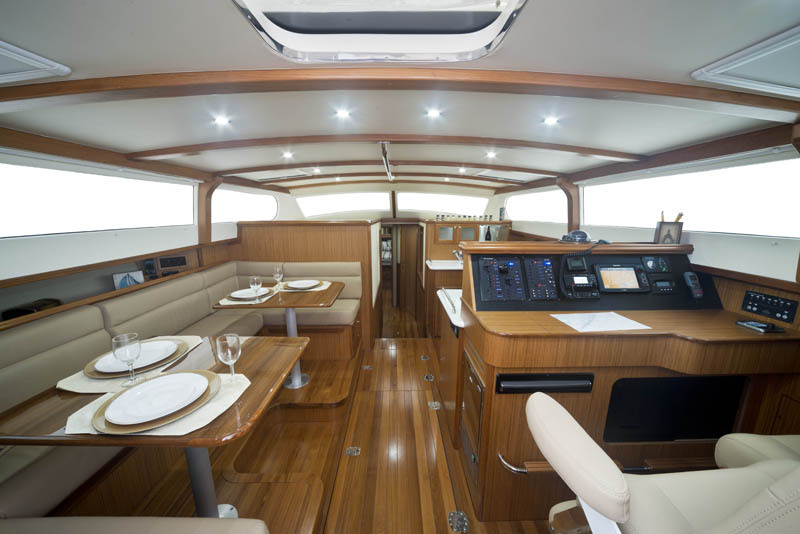 boat! 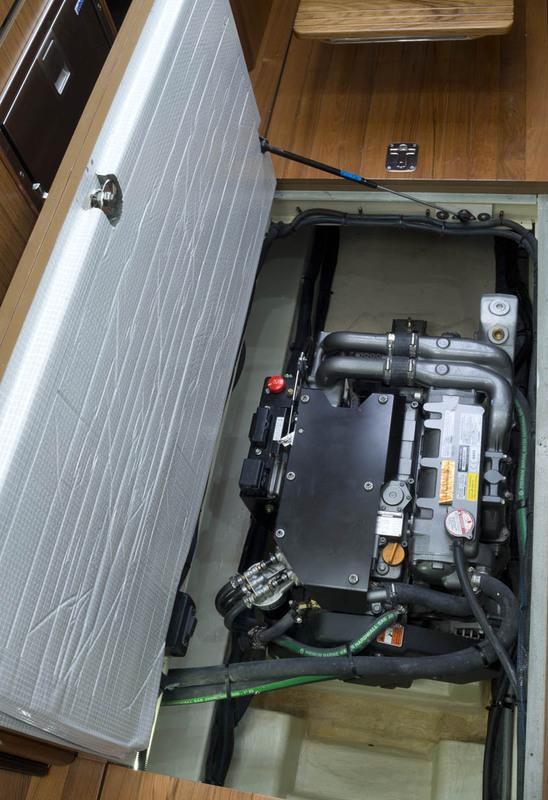 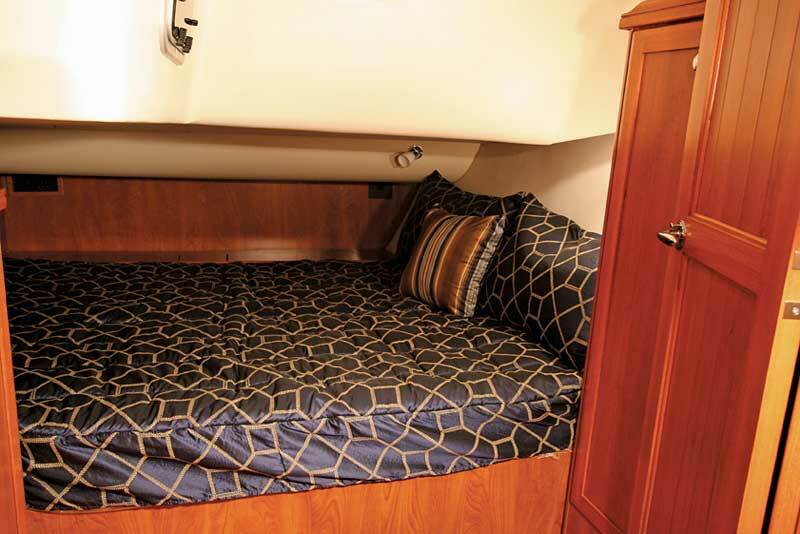 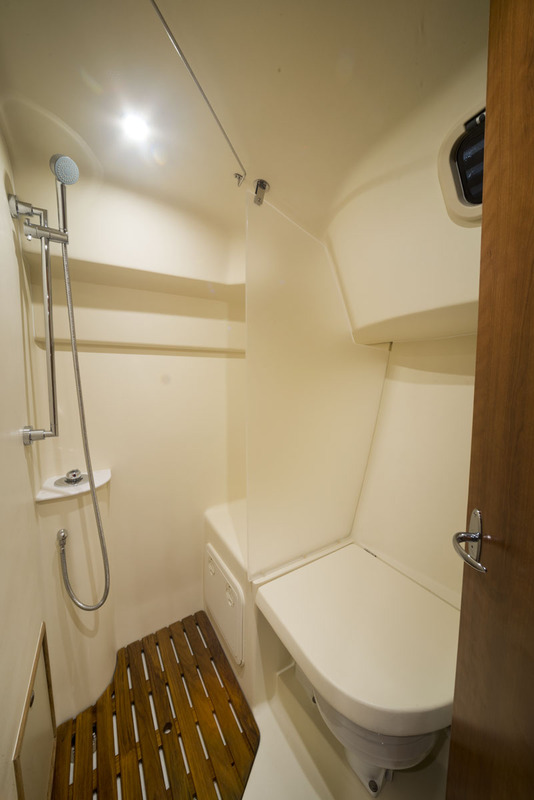 We selected the configuration that offered a forward v-berth cabin with head (recommend the electric heads with freshwater fill) avoids smelly odors from salt water and pumping! 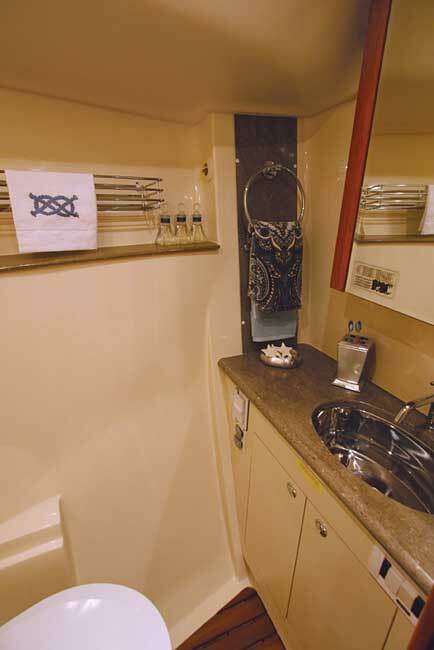 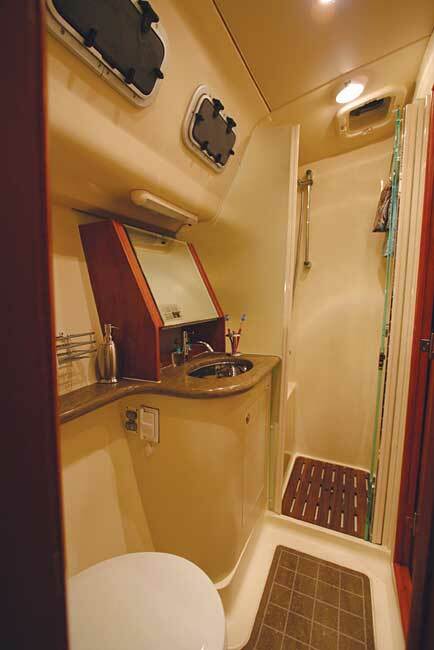 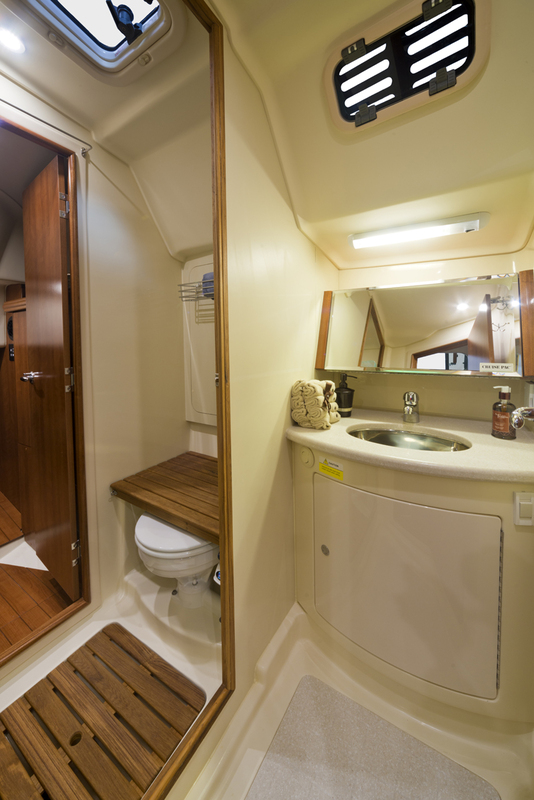 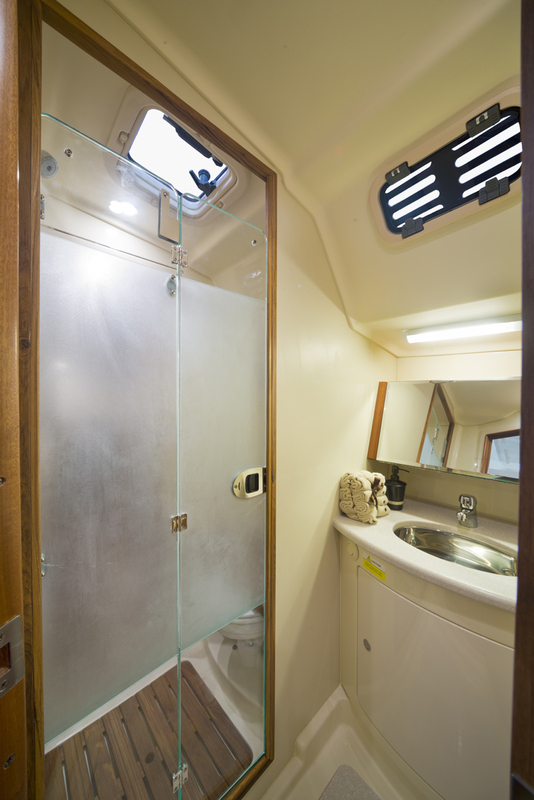 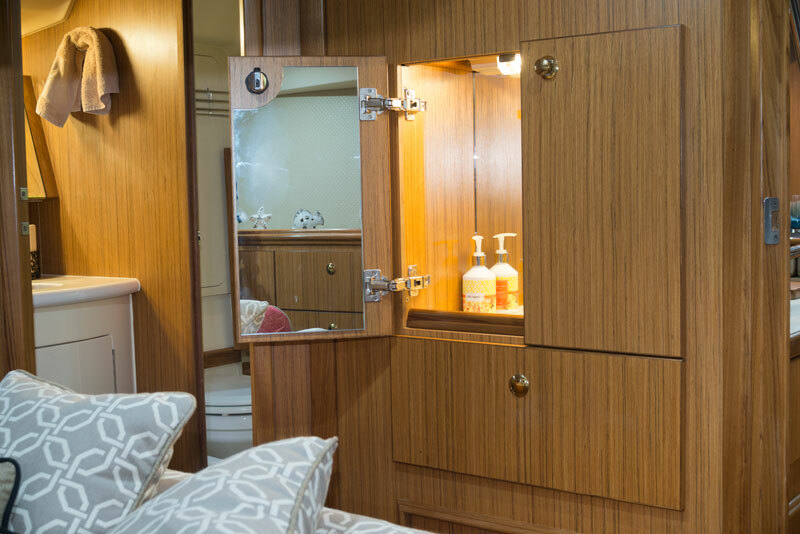 The shower(s) are very spacious and the we chose the single rear stateroom with its own head and shower. 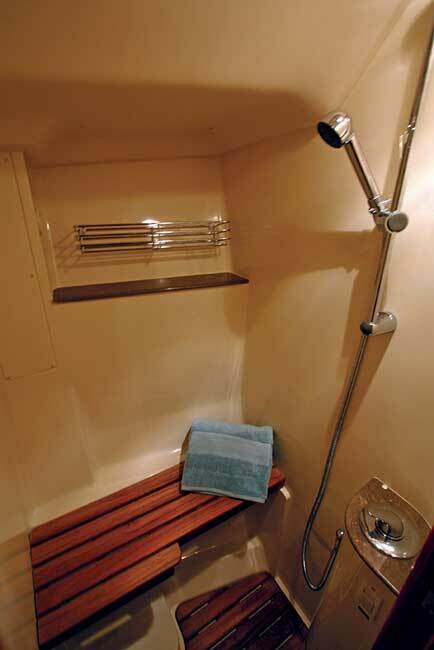 That extra space for clothes is great. 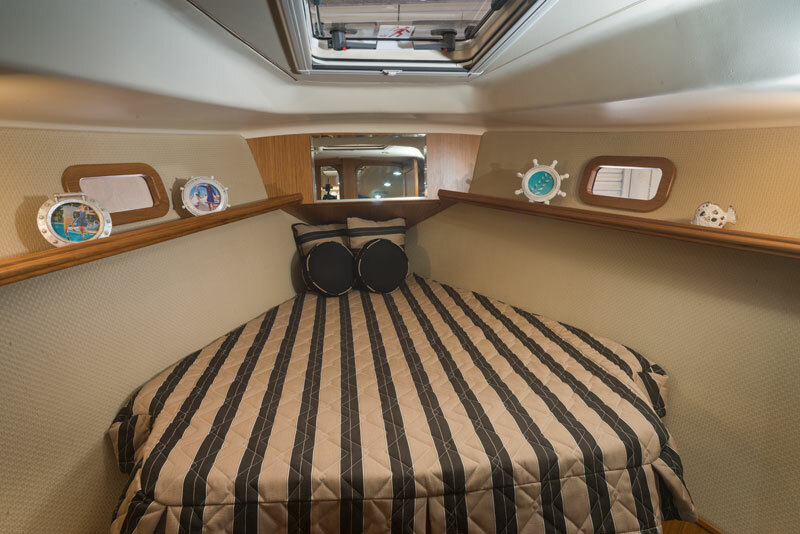 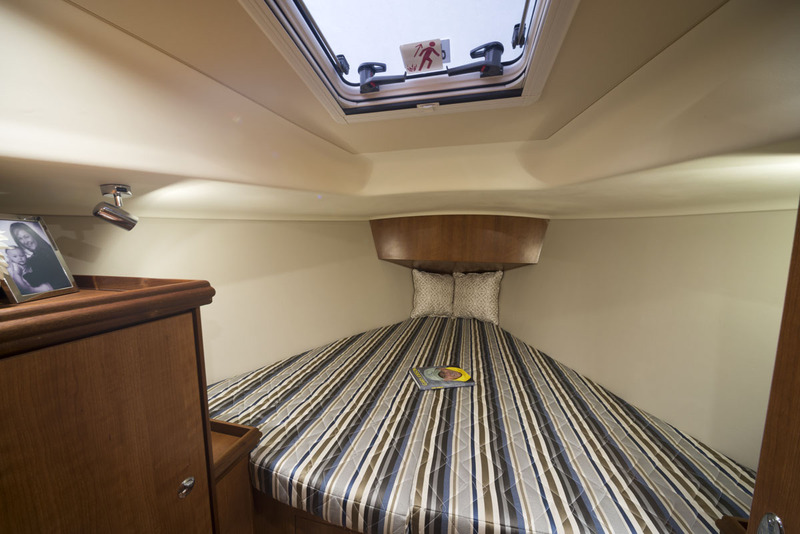 The central salon also makes up into a double berth to make for comfortable accommodation for 6 people. 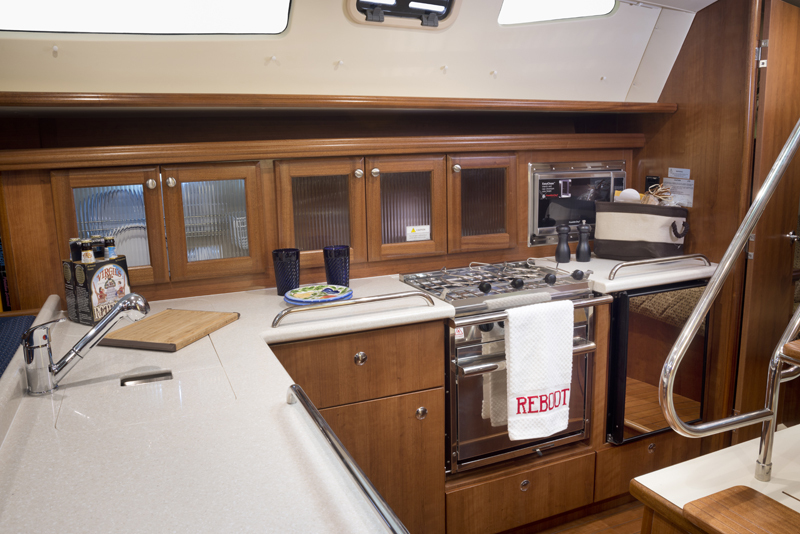 We also love the galley/kitchen and went with all the “bells and whistles options” – separate fridge and freezer, microwave, oven and stove. 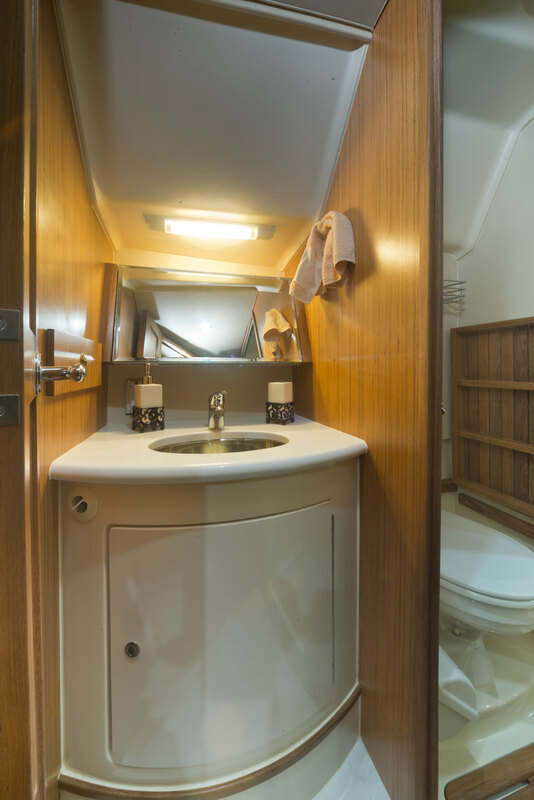 Plus double sinks. 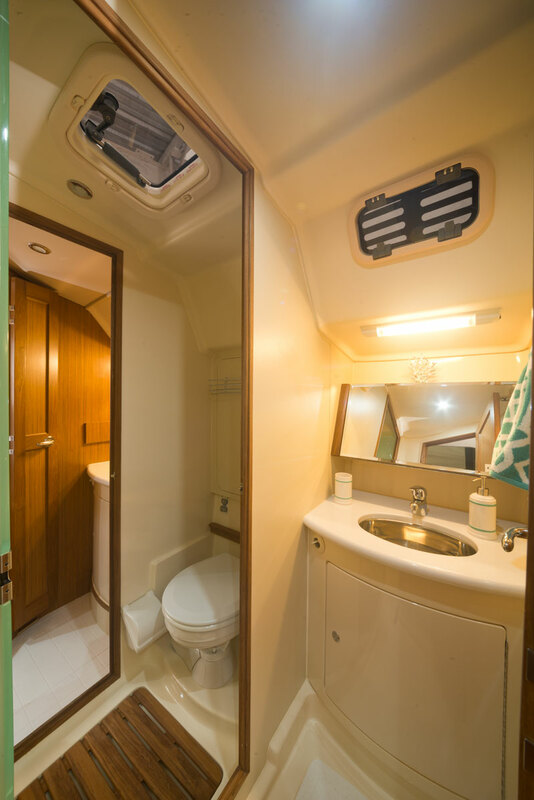 The double air conditioning units work great although we also added three fans that help to circulate air if you don’t want the air on. 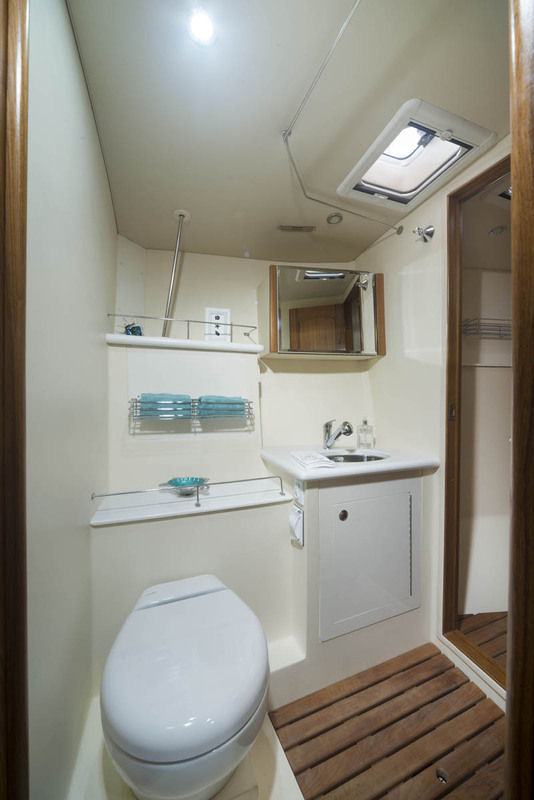 There is lots of light in the cabin and multiple hatches to provide lots of fresh air if you want it. 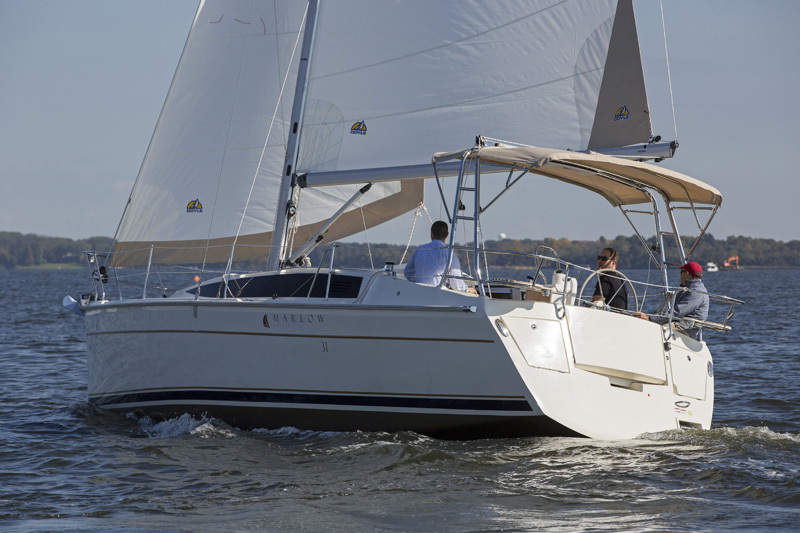 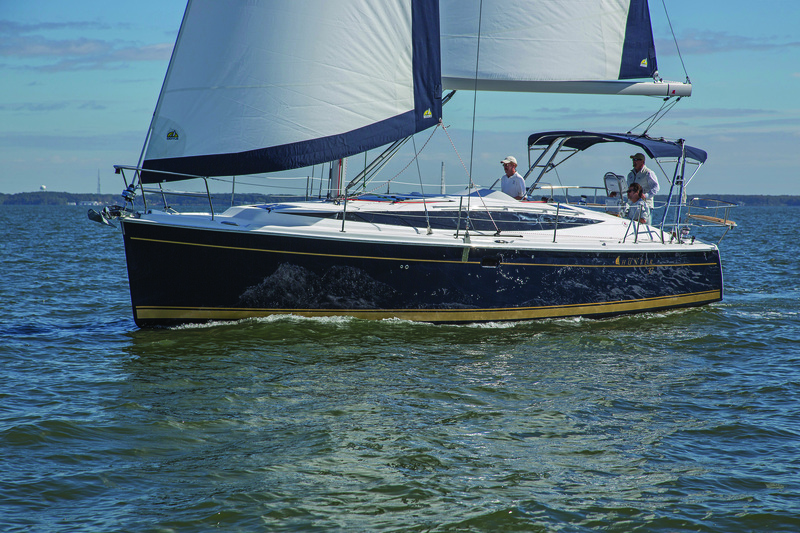 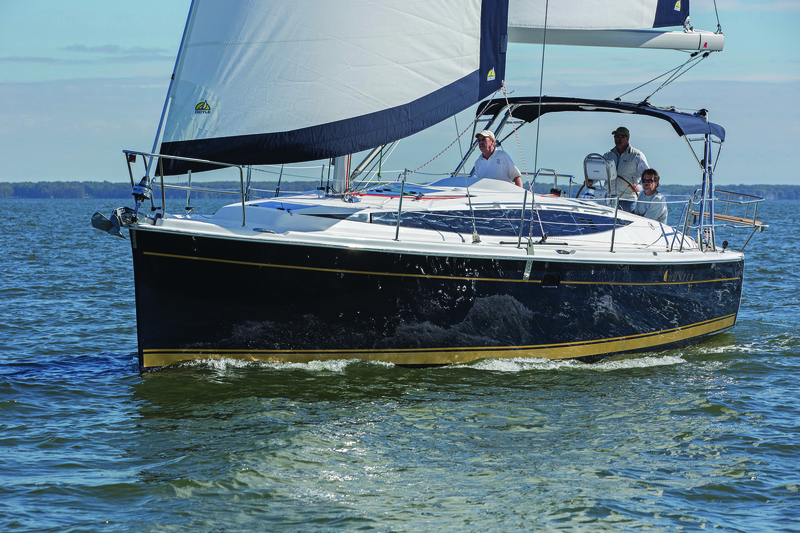 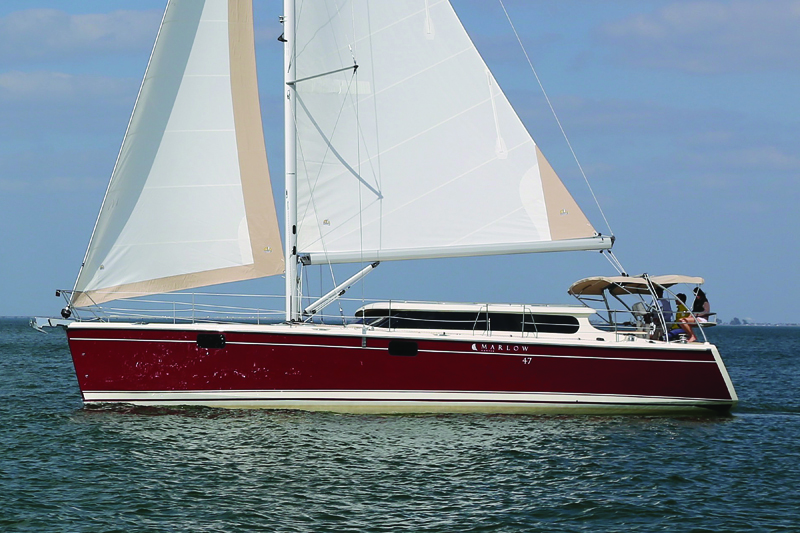 Sailing wise the 40 is fast in light winds and is easy to sail on your own. 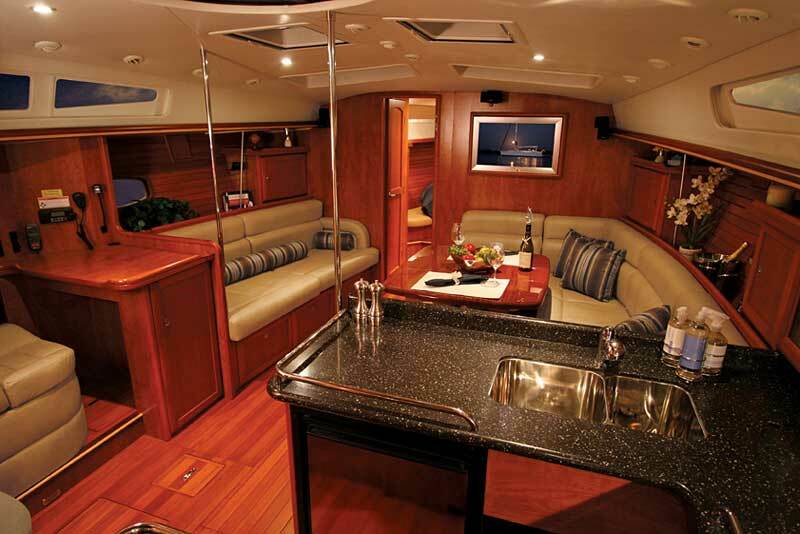 I have four Lewmar winches two 40’s and two 45’s. 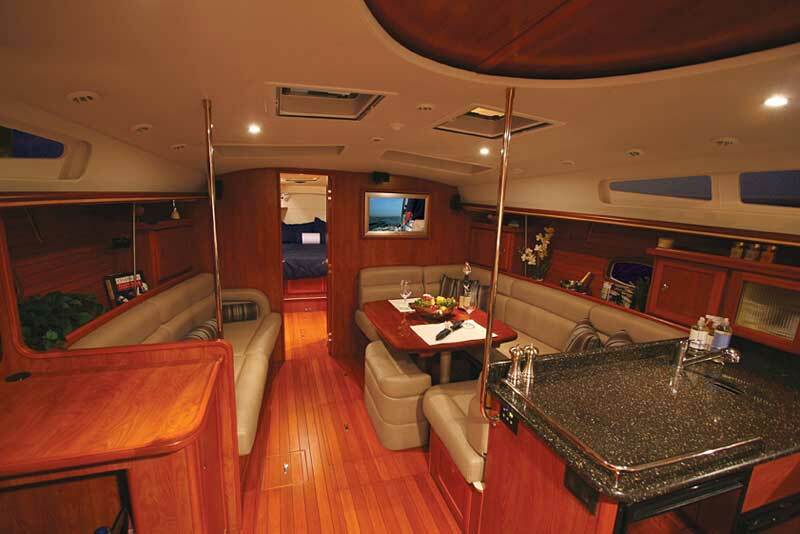 I didn’t go with power winches although not a bad choice for furling the main! 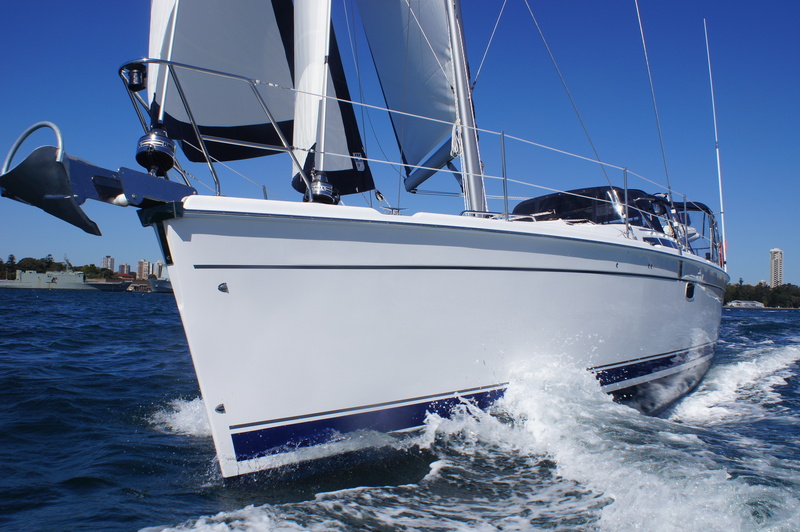 Once your main is out and jib/genoa are deployed it’s very easy to tack or jib on your own! 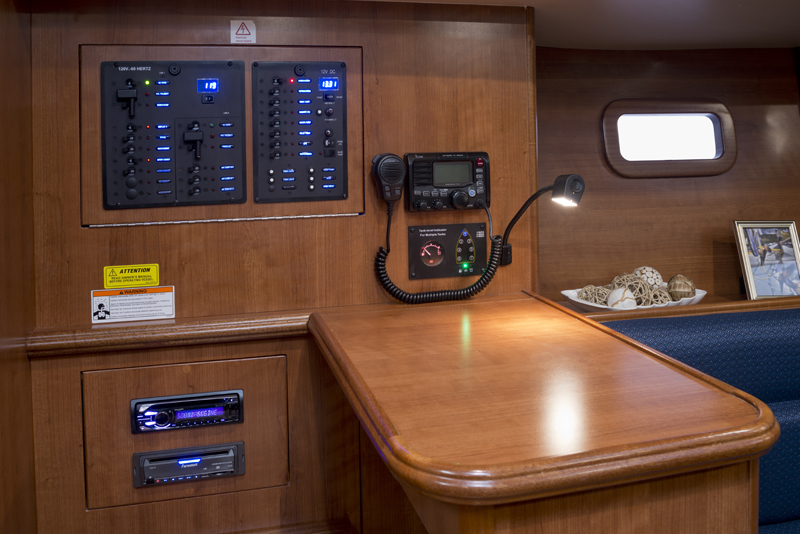 I also went with the Raymarine electronics which are all interconnected, the C95 unit (at the inside map station) and E125 as my main unit at the helms work great. 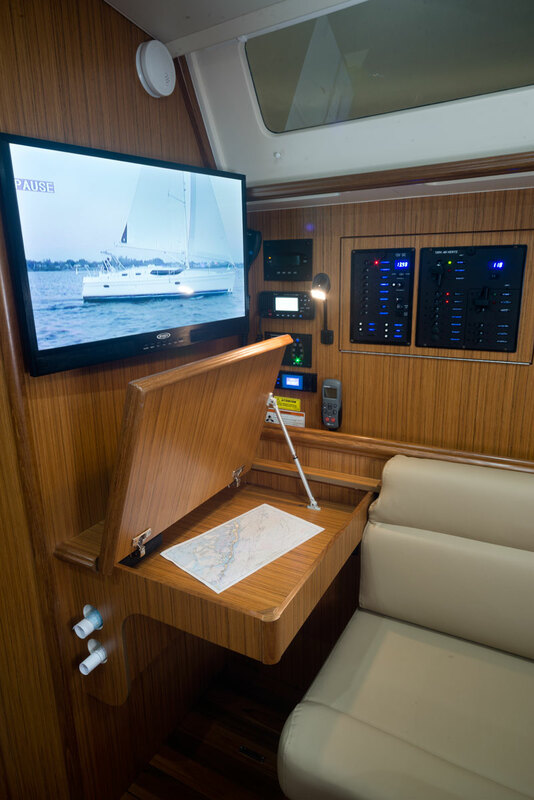 I complimented the helms with twin I70 multi units, and a Raymarine autopilot which works great! 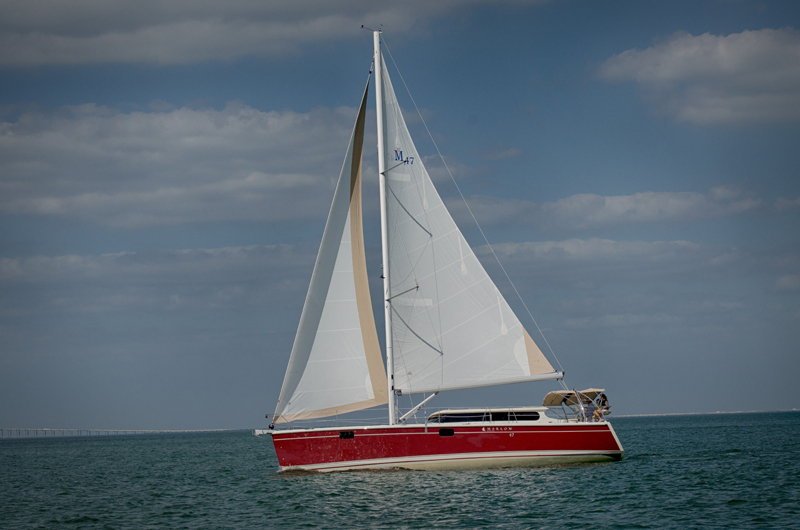 Plus I added the color radar…all good options for long range sailing! 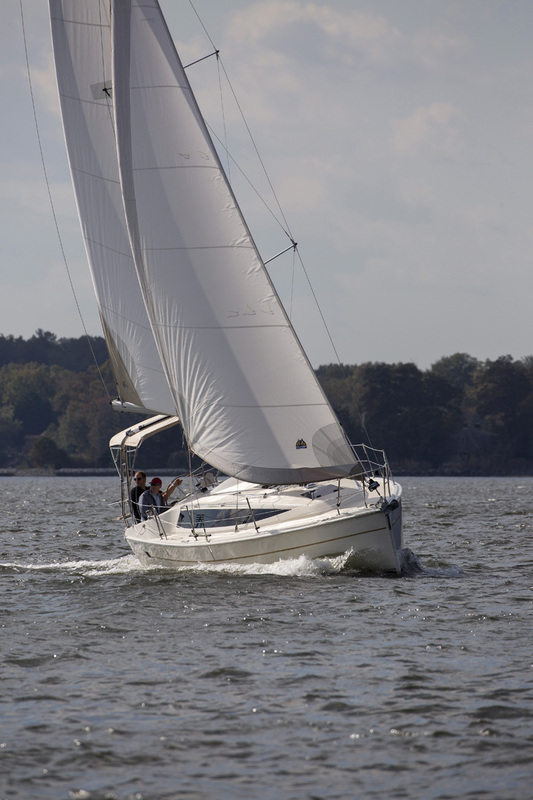 We love sailing our boat which we named “Pegasus” in light or stronger 10-20 knot winds, she’s fast and will reach 7-8 knots and very responsive when the vang, main and jib are “tweaked” in conjunction with the multiple travelers. 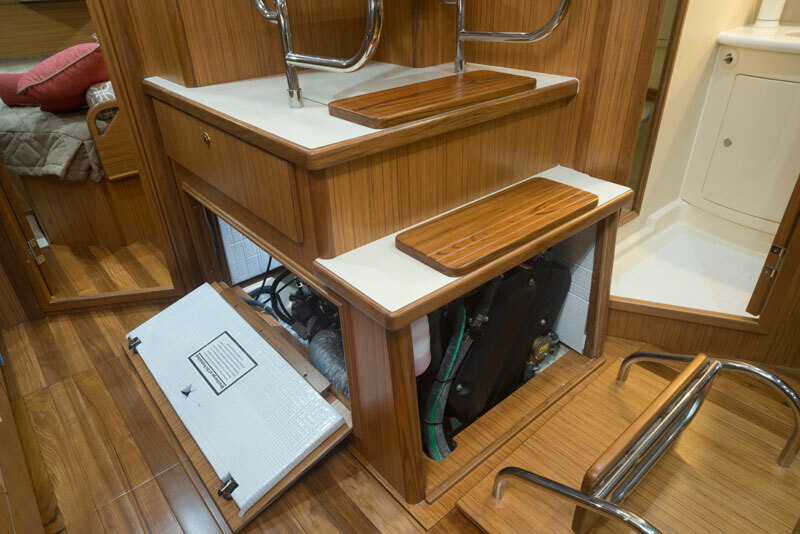 We also selected the optional davits which are very well made and have put a double skinned RIB with a 6hp outboard. 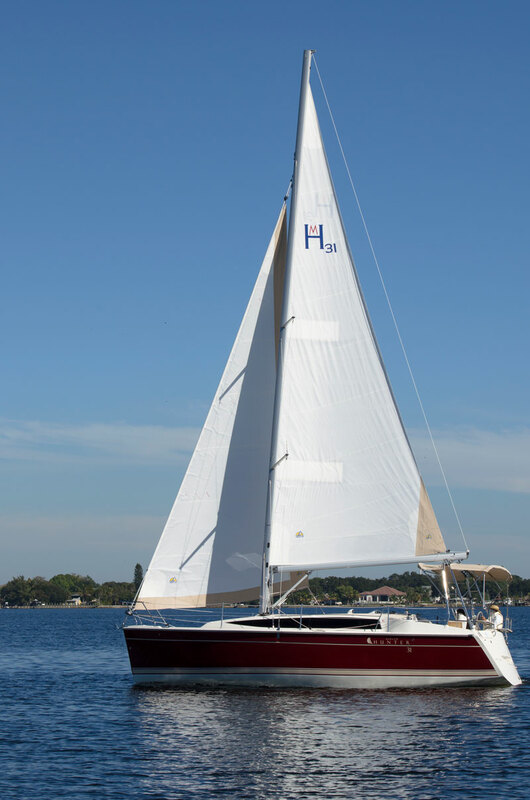 This is easy to deploy and we added a double 6 to 1 Harken’s to help deploy the dingy. 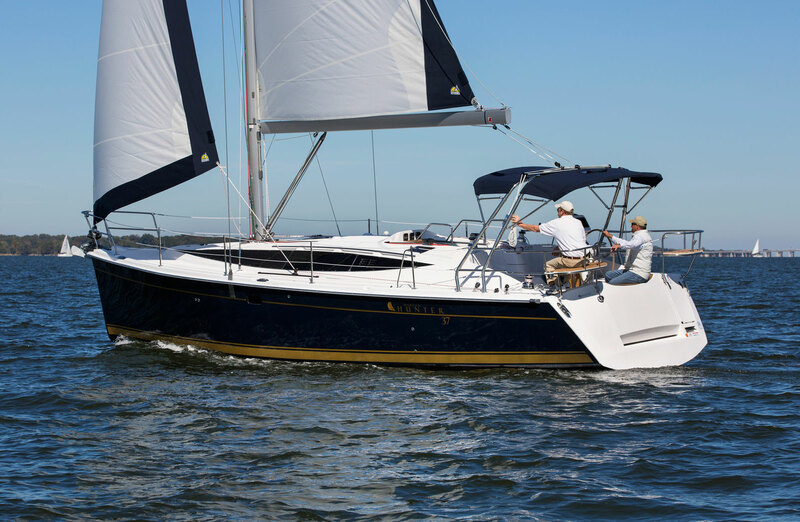 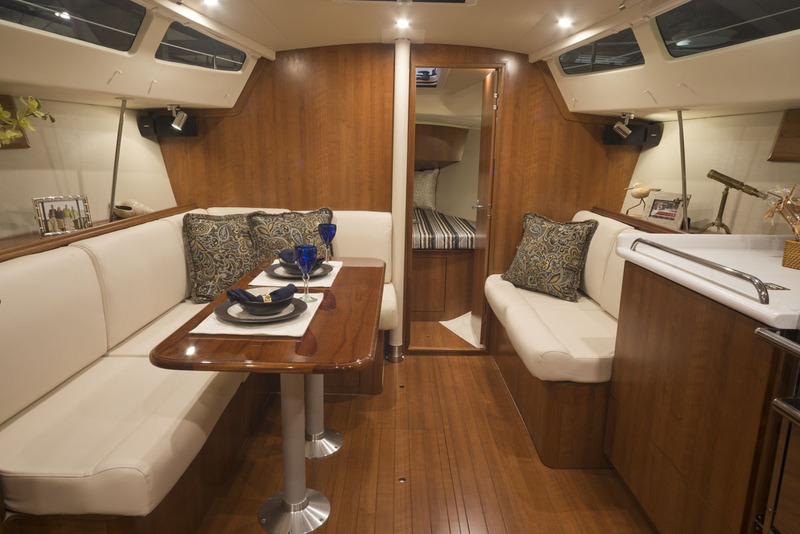 All in all, we love this 2015 Marlow-Hunter 40 and would recommend both the boat, Marlow-Hunter and Sailing Florida Charter of St. Petersburg to anyone! 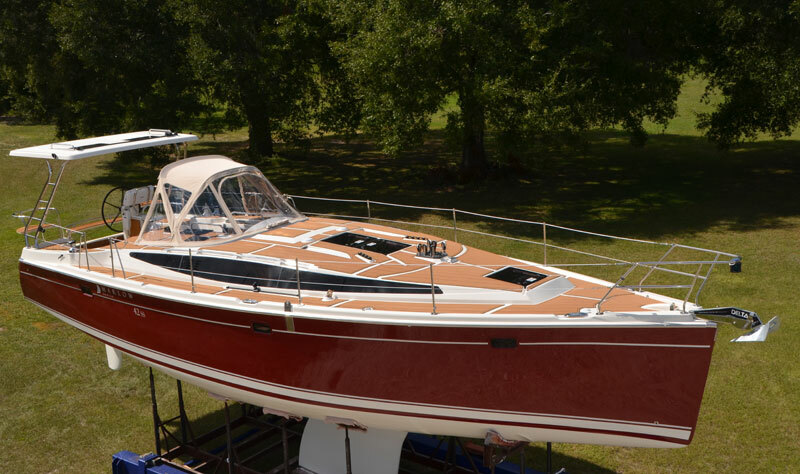 Hope this helps other prospective buyers/owners or people who may want to charter a new Marlow-Hunter 40 from the owner of “Pegasus”. 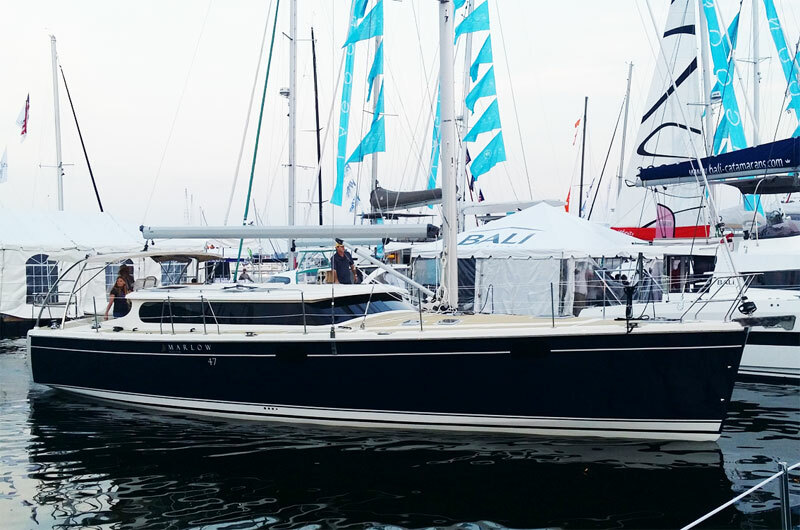 The Marlow-Hunter 31, which has a length overall of 32’4” and a beam of 11’10” will be a tough contender for any model in her size range that tries to compete with the volume below. 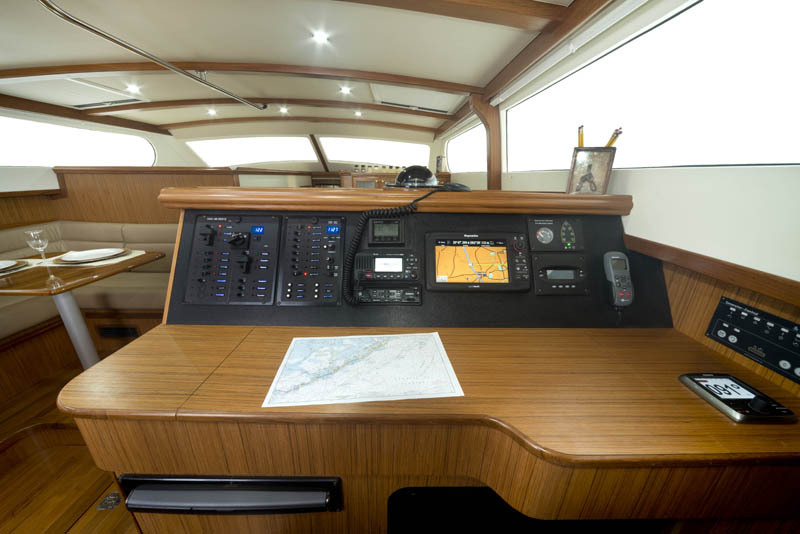 One of her best features is the spacious cockpit that delivers a feel more like that of a larger boat. 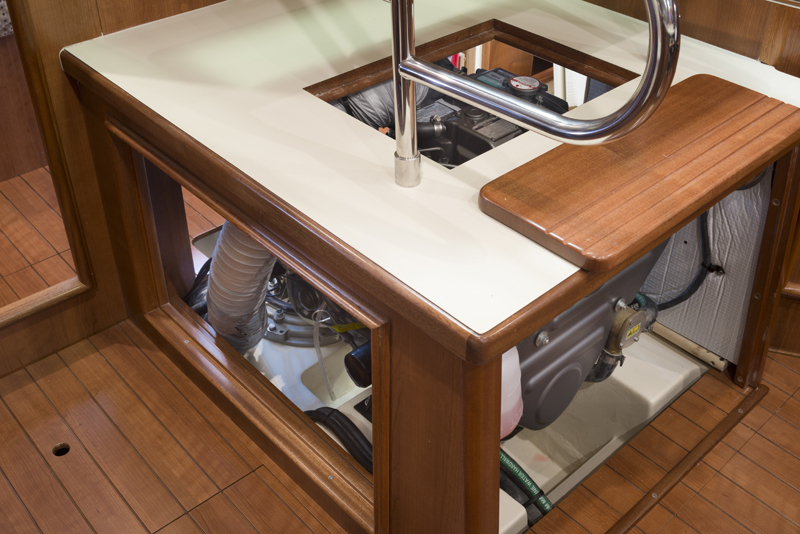 To allow maximum utility, we developed the tacking helm pedestal, where at the push of a pedal, the wheel follows the helmsman to his or her preferred steering location, centerline, port side or starboard using far less space than a twin wheel setup. 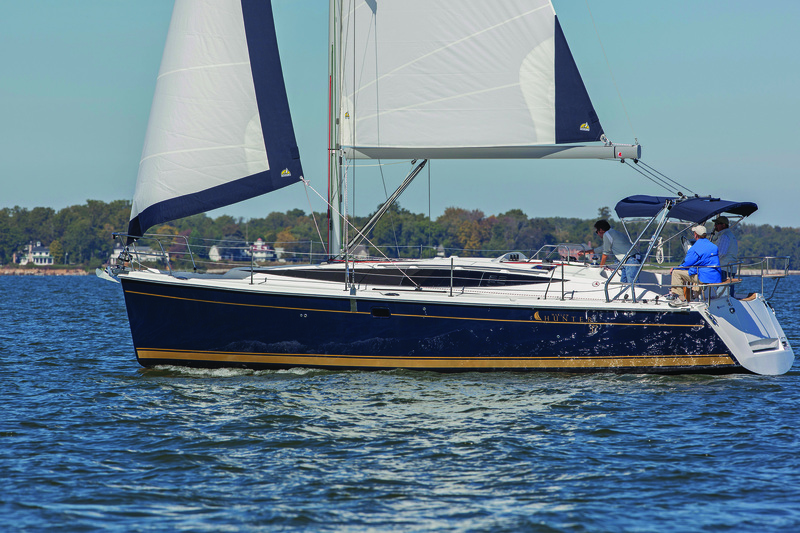 Performance will also be one of her strong features utilizing a furling main with a large sail plan and Glenn Henderson hull design plus hard chine aft below the waterline which has become a signature for Marlow-Hunter sailboats built under David Marlow. 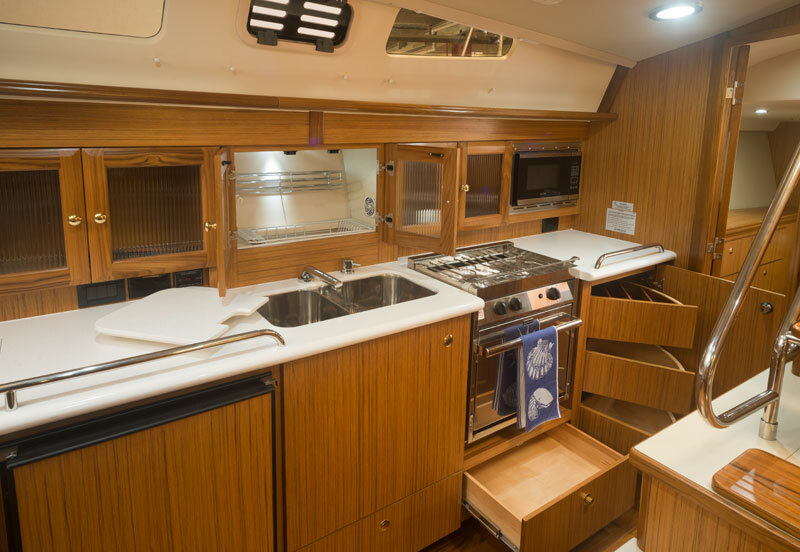 Below, her quality fit and finish is hand crafted using real teak furniture and floors, Corian countertops, ball bearing drawer hardware and name brand appliances and equipment. 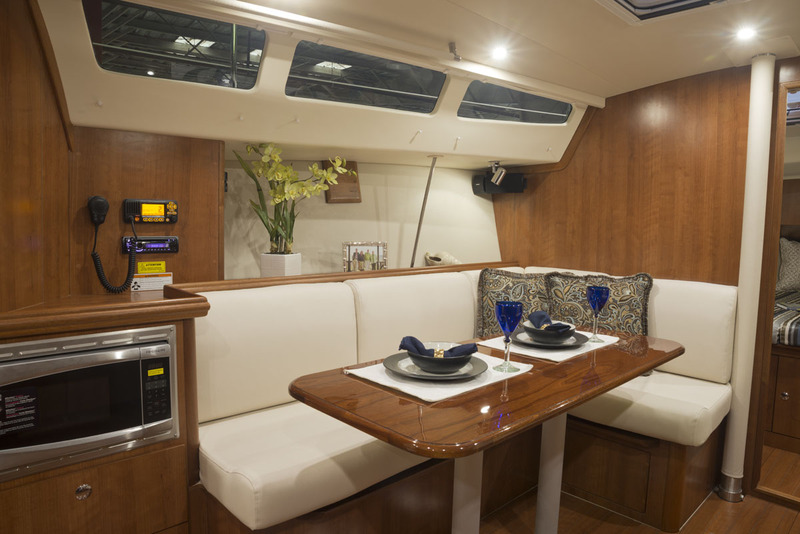 The construction of the hull and deck utilizes Vinyl Ester resins and gel-coats, continuous reinforcement fibers. 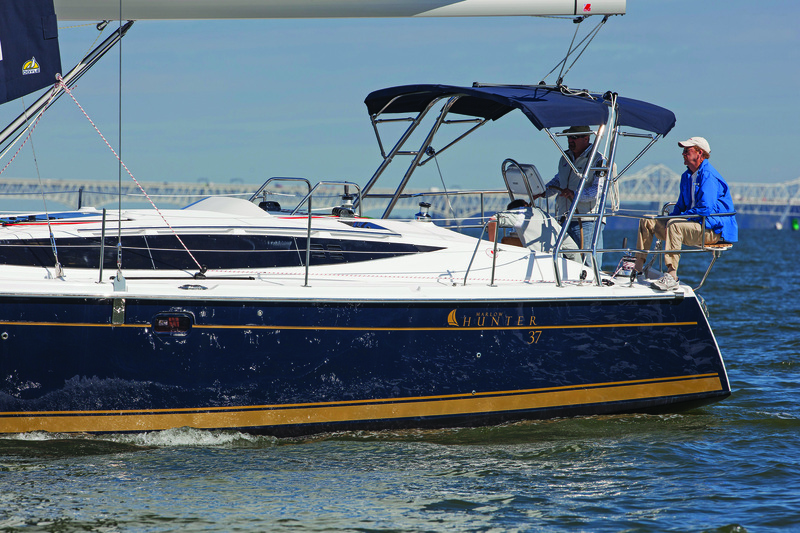 Kevlar and state of the art Nida-coring add structural integrity to provide added peace of mind. 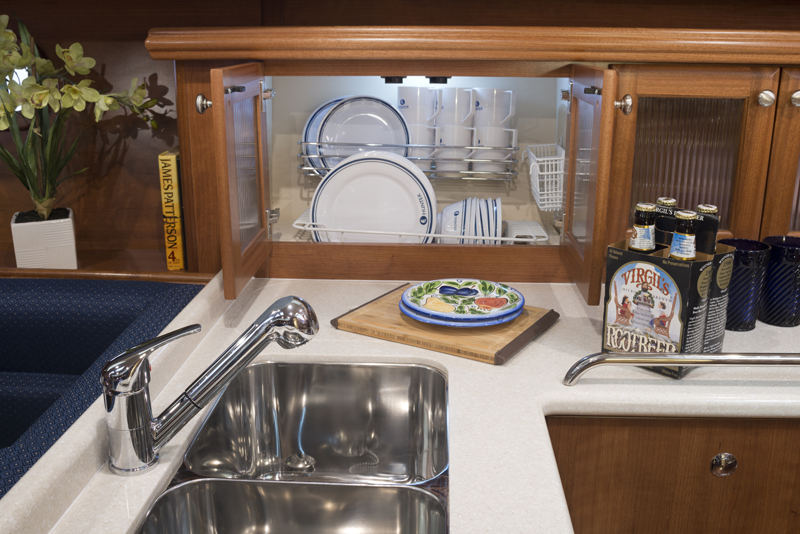 Discover the difference a Marlow makes at $137,912.